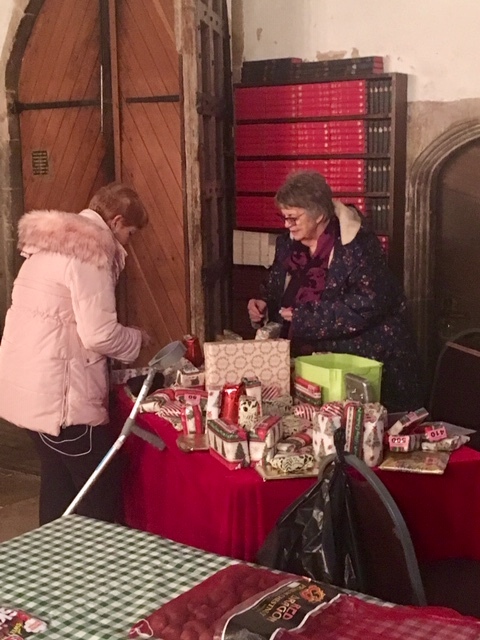 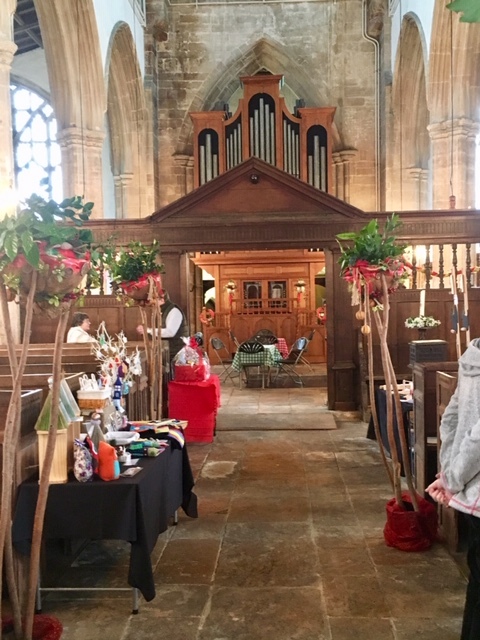 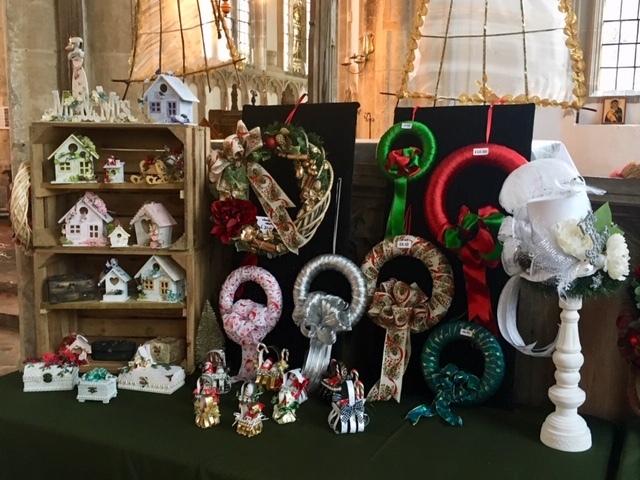 Once again to mark the start of Advent we held our annual Advent Event and market. 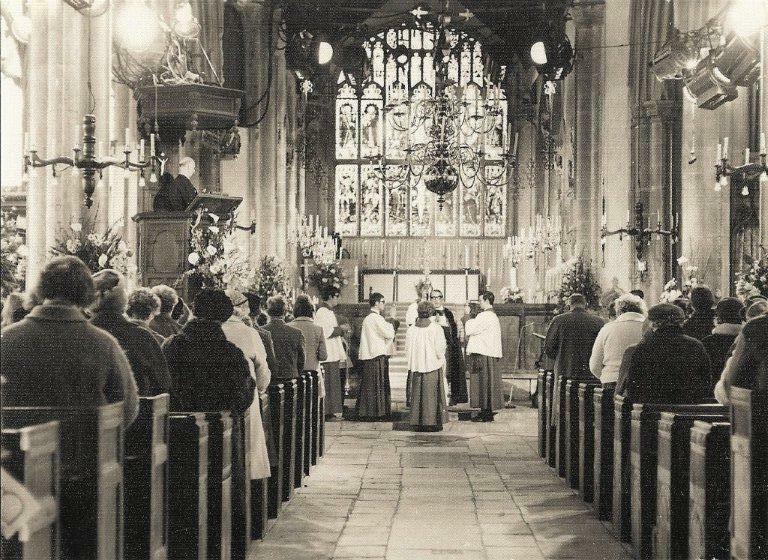 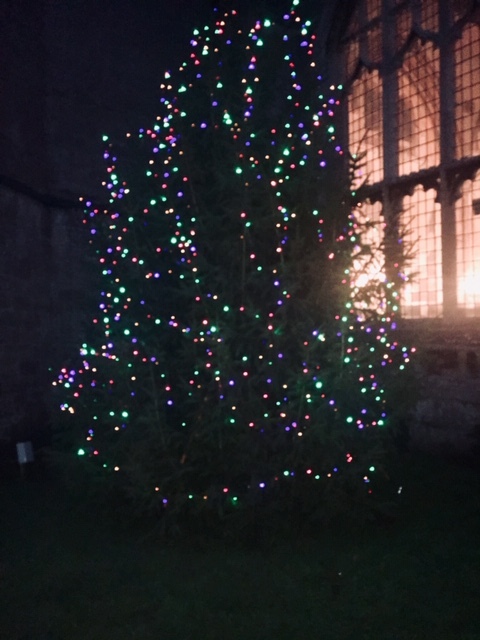 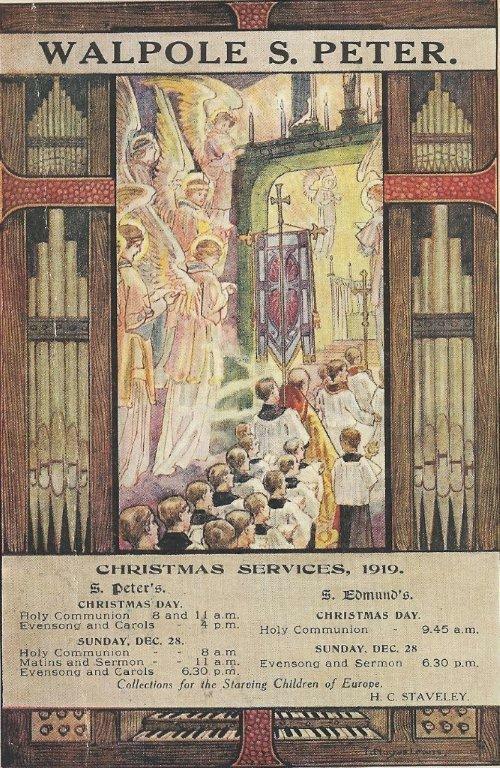 The church was decorated and there was the opportunity to watch the lighting of the Christmas tree and to sing some traditional carols.The event proved very successful and was enjoyed by all who came along. 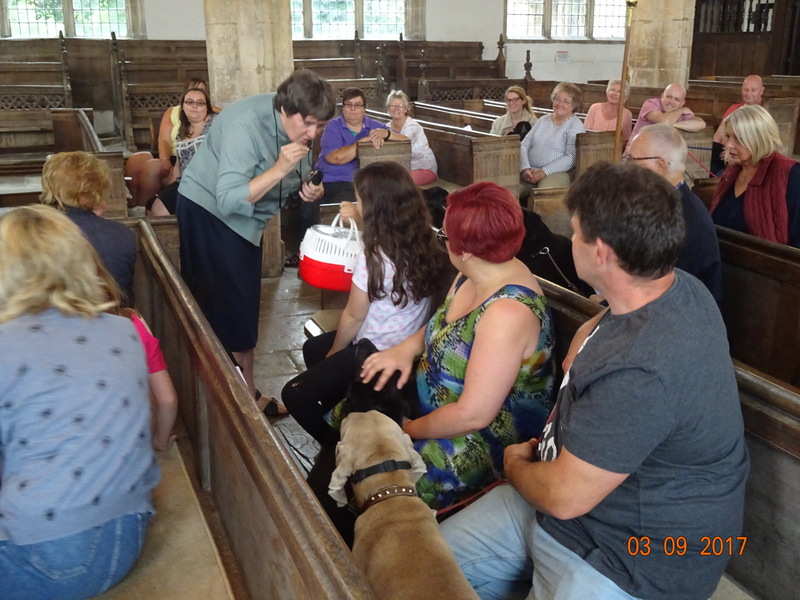 Many thanks to everyone who helped put this together.Here are some photos from the day. 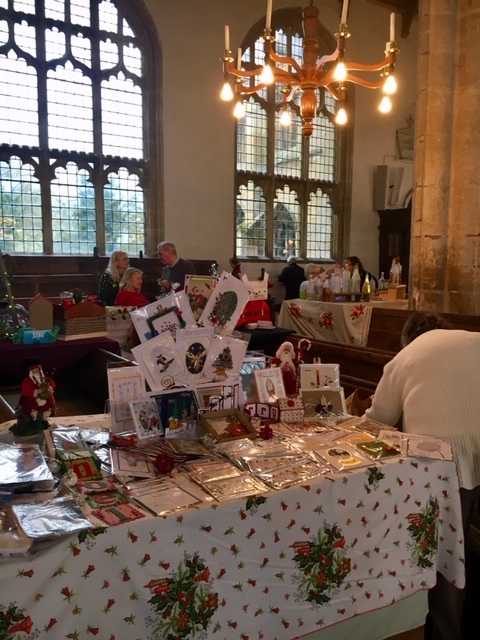 As a reminder our Spring Market will be held on Saturday 13th April 2019 - More details to follow. 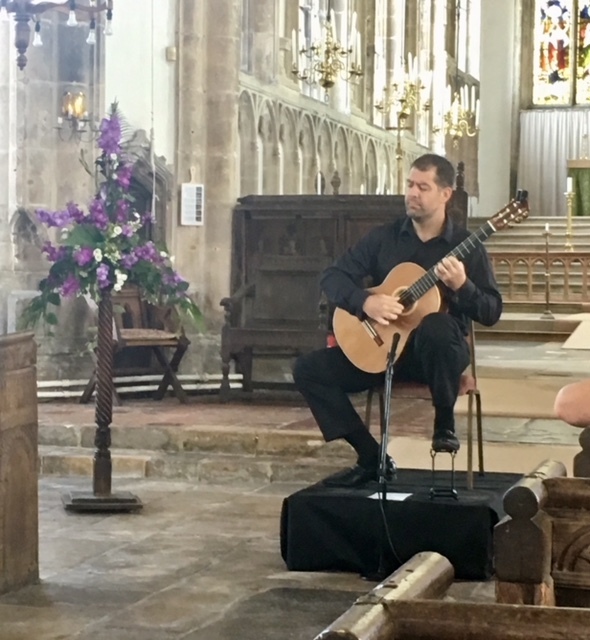 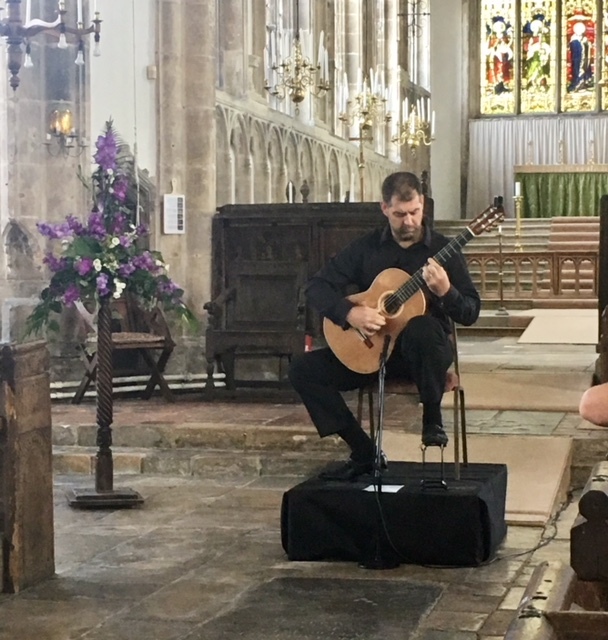 Guitarist Estevao Devides, who originates from Brazil, but who now lives in Kings Lynn came to the church on a beautiful summer afternoon to entertain us. 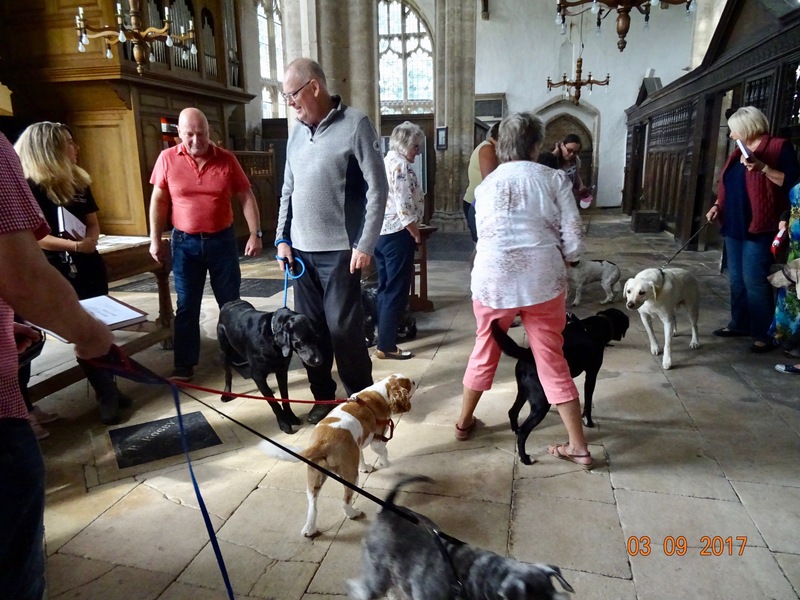 The turnout was good and a very enjoyable time was had by all. 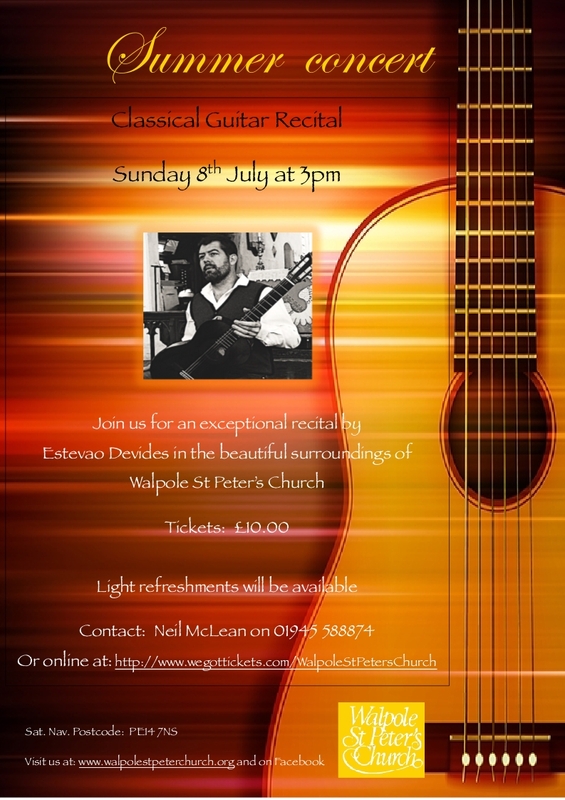 A very skilful guitar player Estevao played a wide selection of music and songs, some of which originated in Brazil. 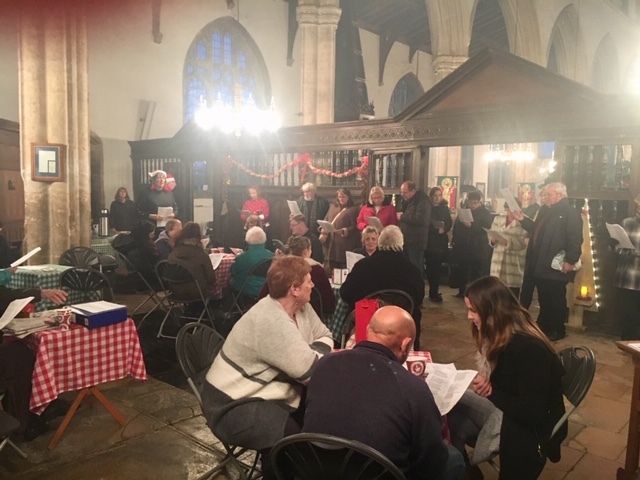 Refreshments were served including very welcoming glasses of Pimms and our church community came out to support this event. 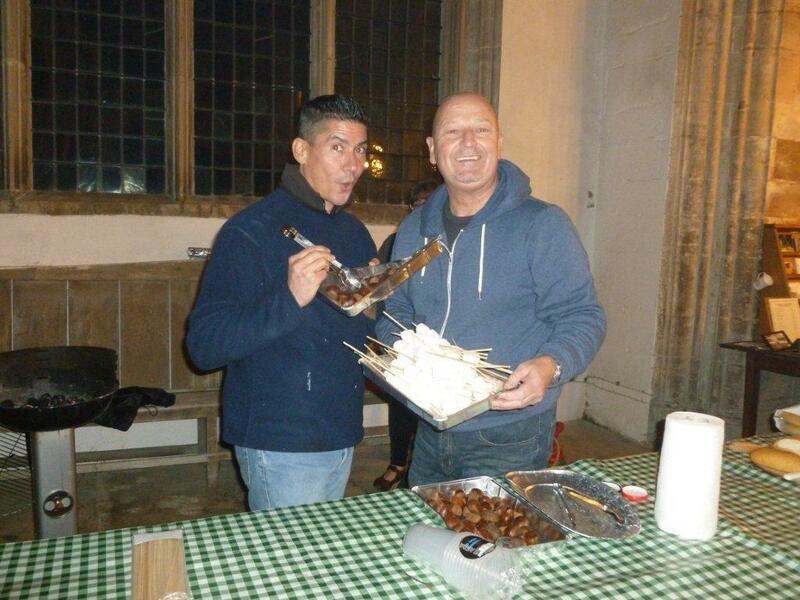 We very much look forward to welcoming Estevao to the church again in the future. 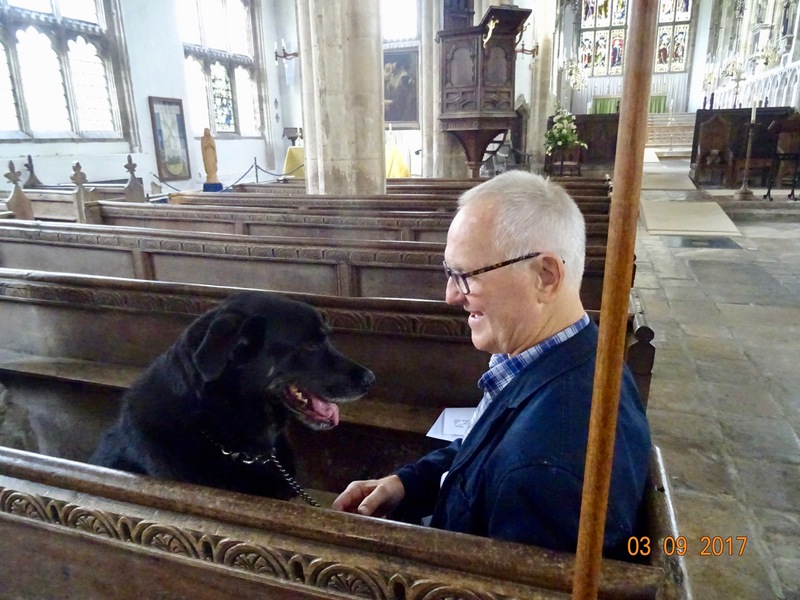 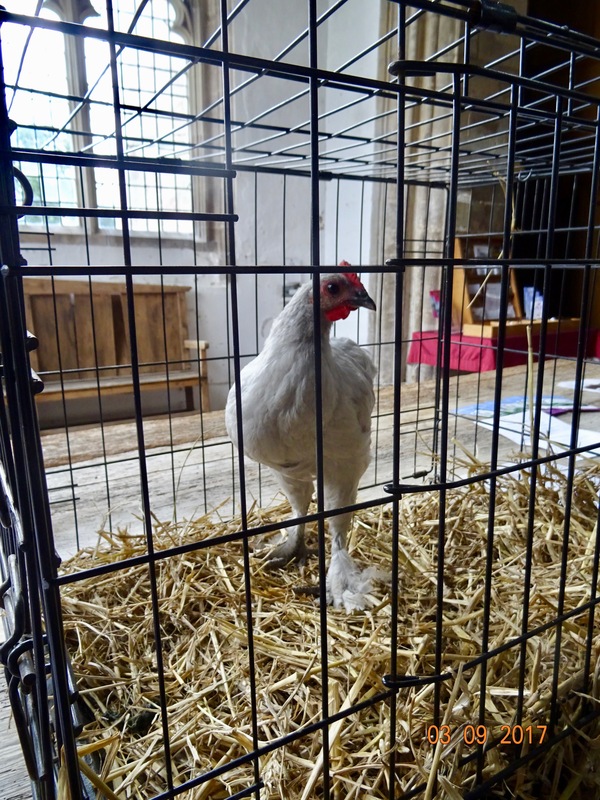 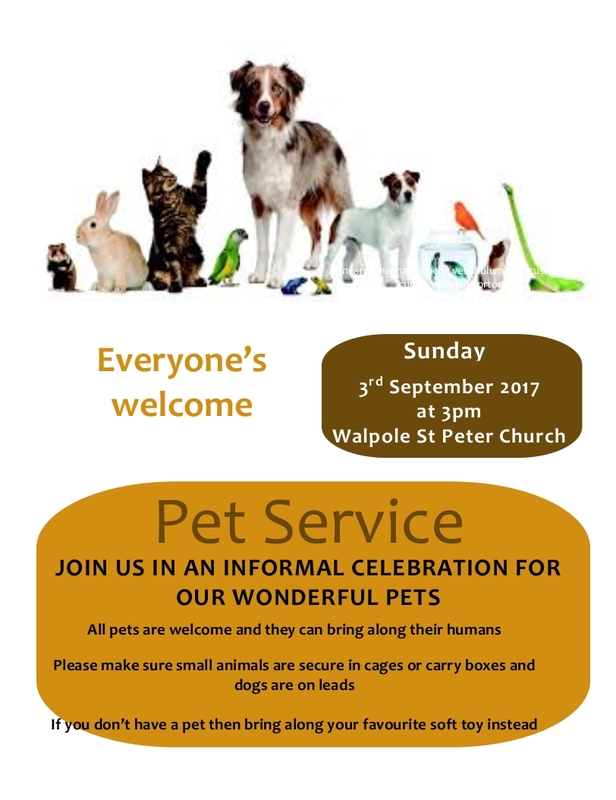 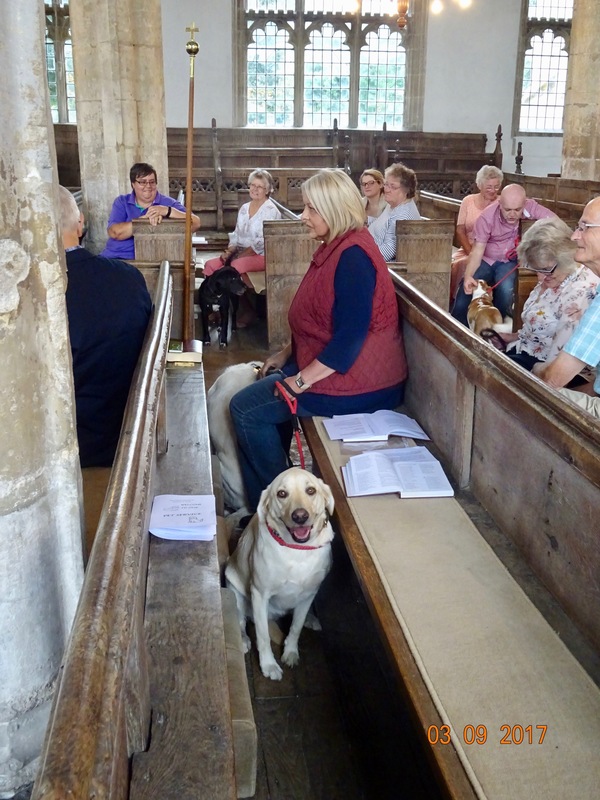 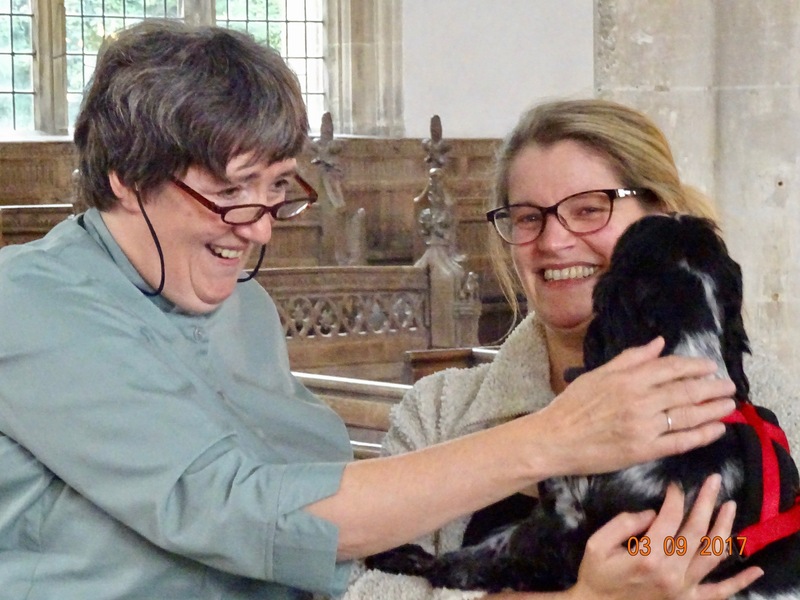 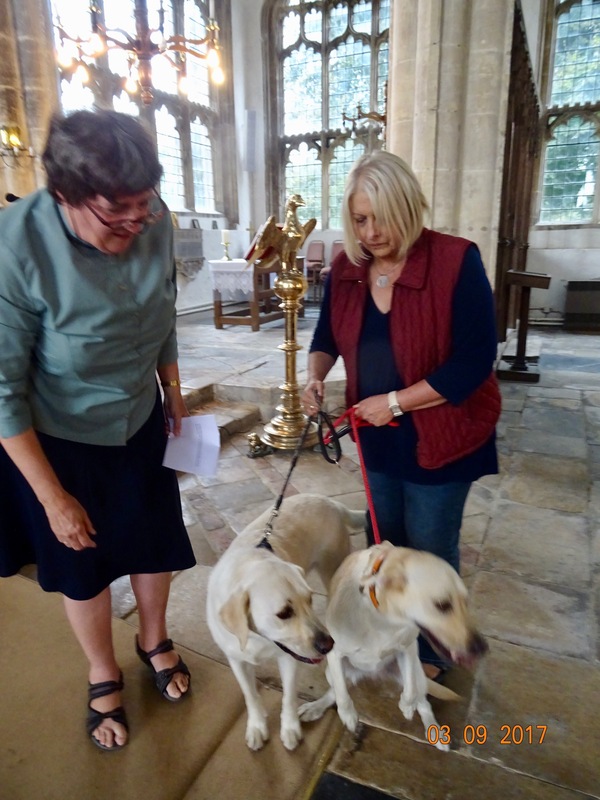 The pet service was held on Sunday 3rd September 2017 in Church and was enjoyed by all who came along. 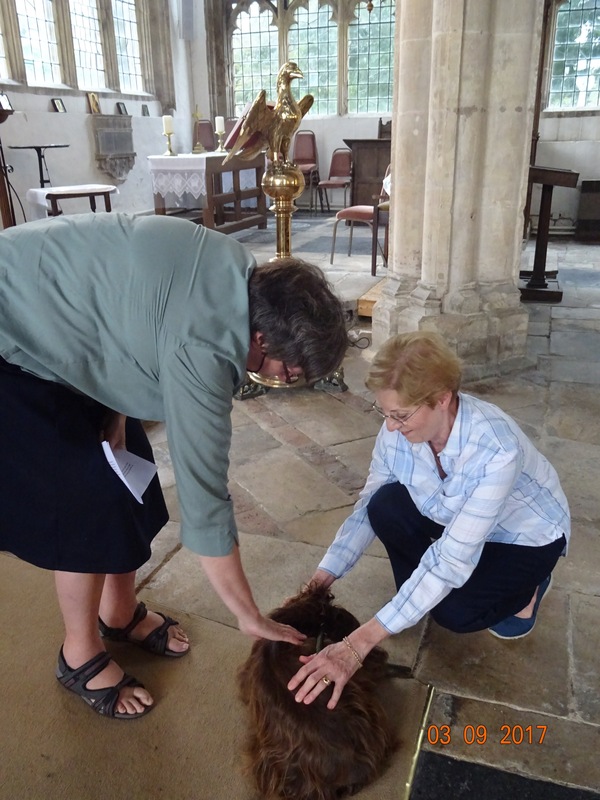 A short informal service. 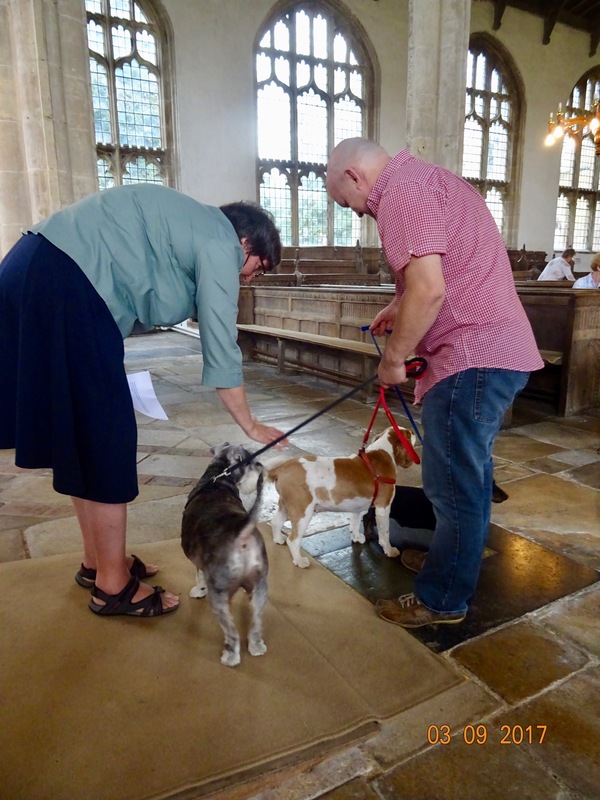 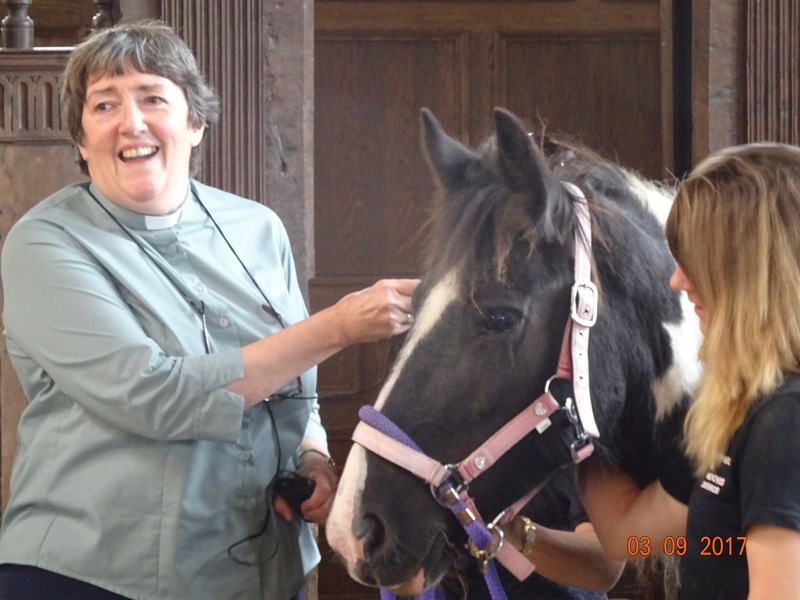 The pets were welcomed into the church and Rev'd Barbara went around asking those of us there what our pets meant to us. 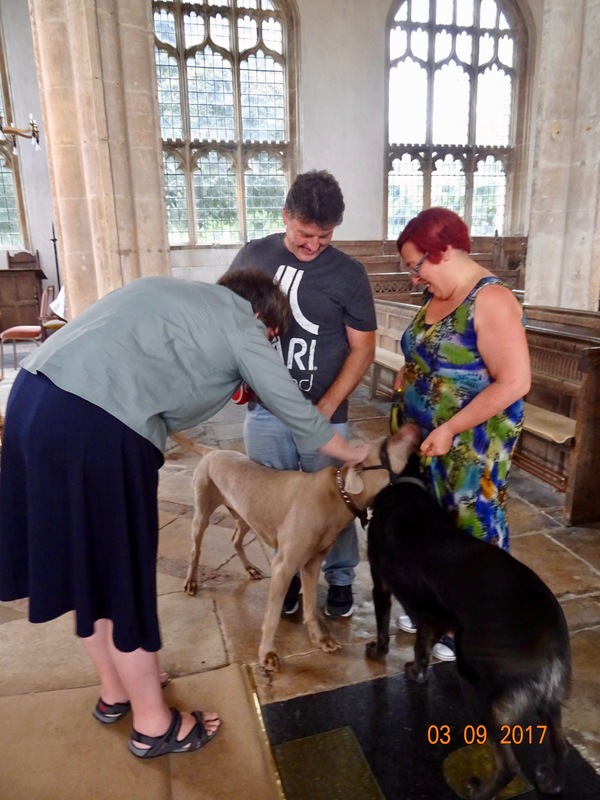 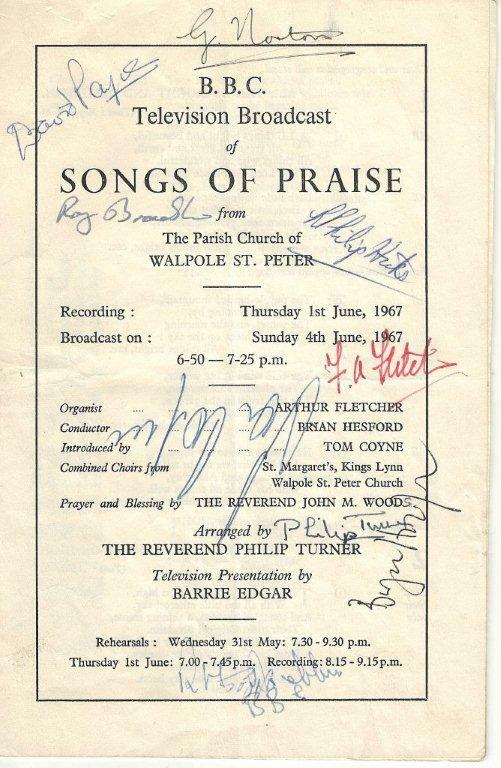 They were all then invited up for a blessing, which I am sure they all enjoyed. 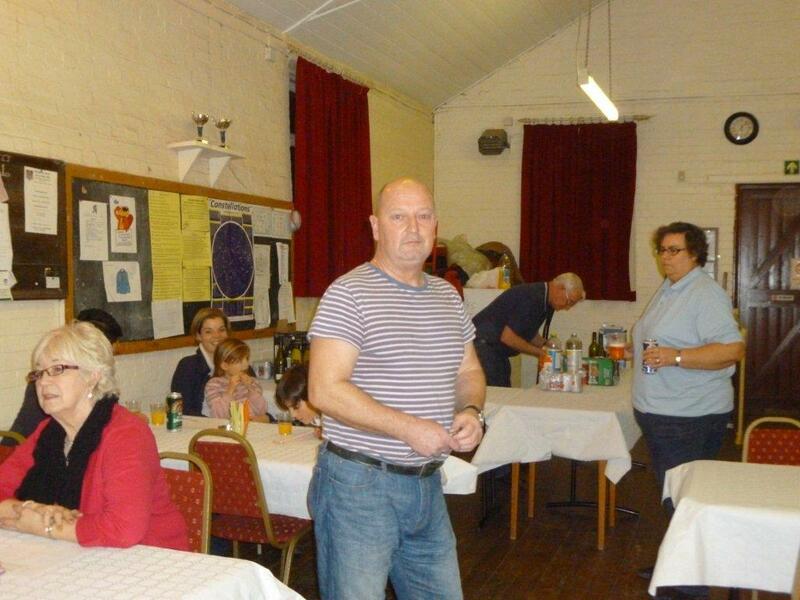 To wrap the afternoon off refreshments were served. 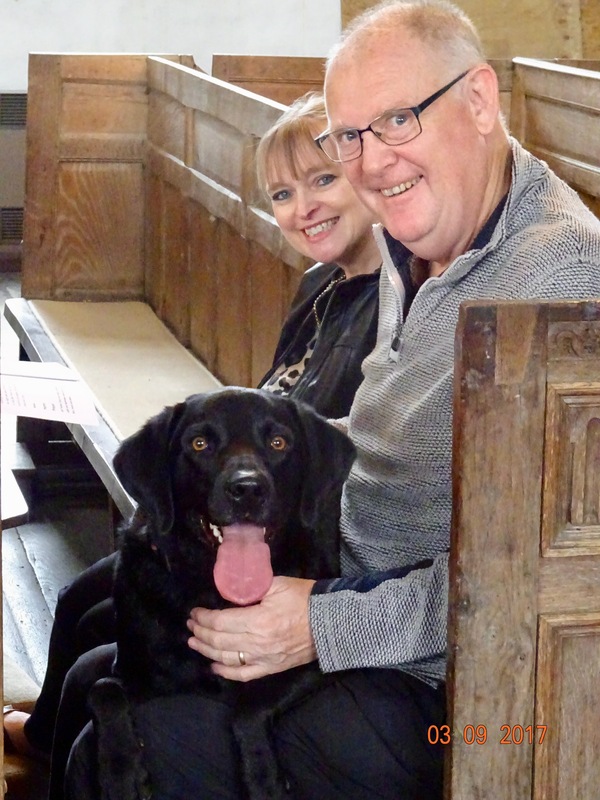 A thoroughly enjoyable afternoon. 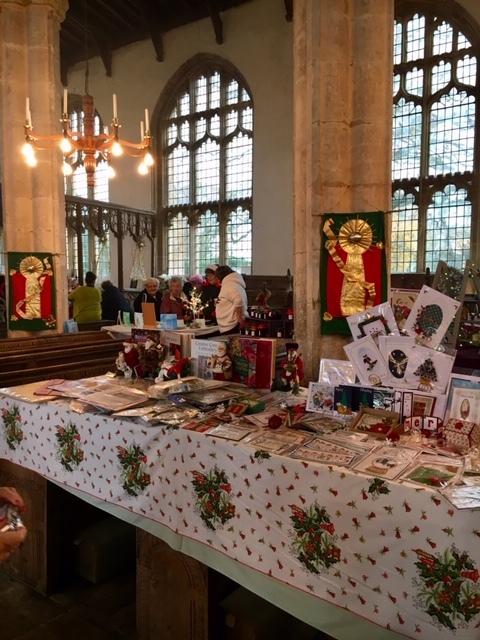 Here are some pics from the afternoon. 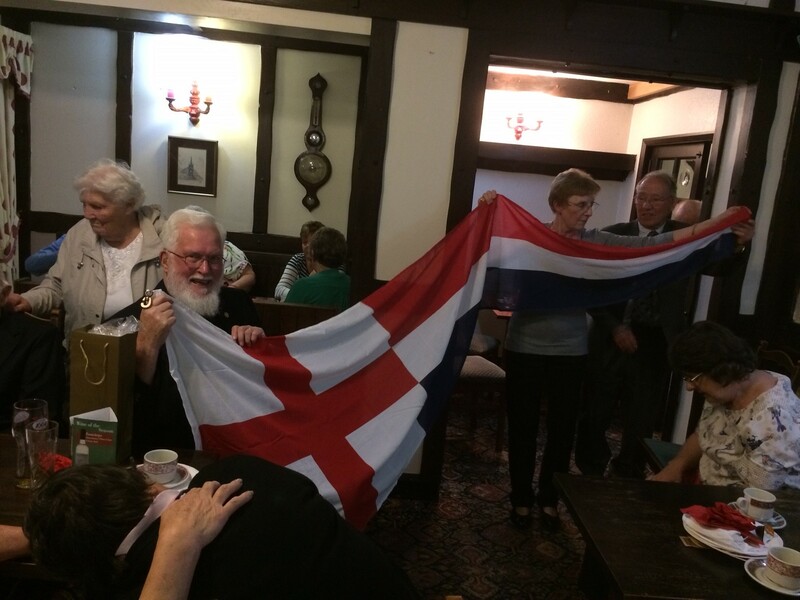 On Tuesday 20th September 2016 many of us were at the King of Hearts in West Walton to say thank you to David Fleming for all his help with the church during this latest interregnum. 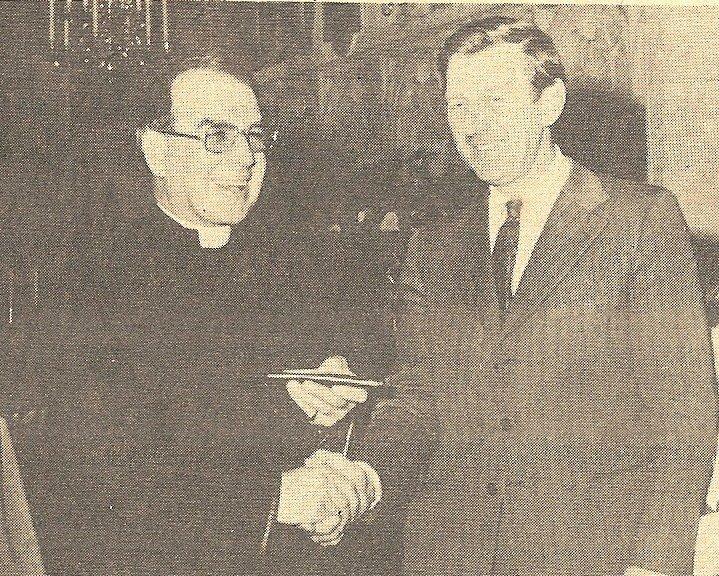 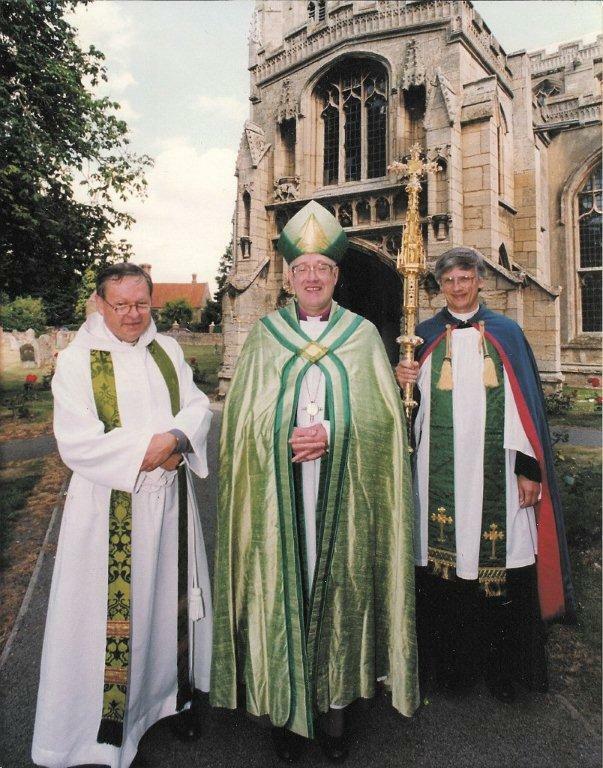 He has been a terrific friend to us all and to the church. 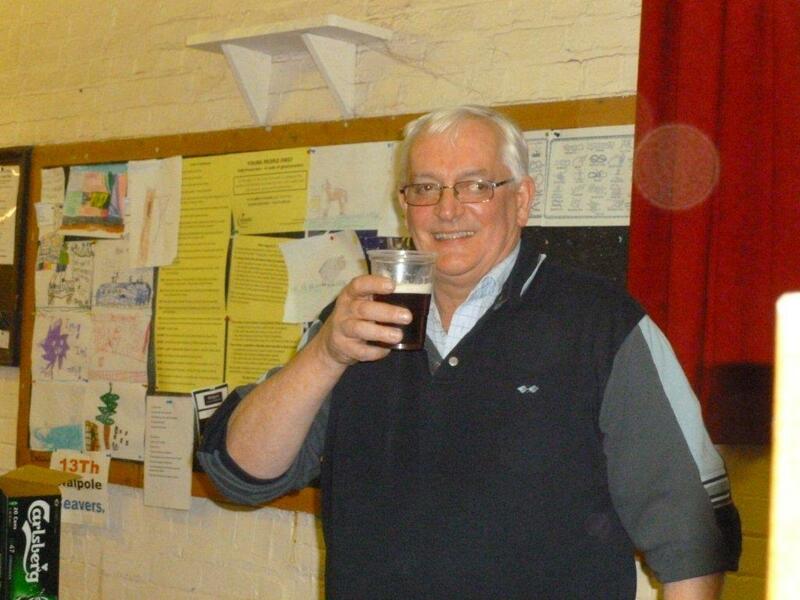 Many thanks to you David. 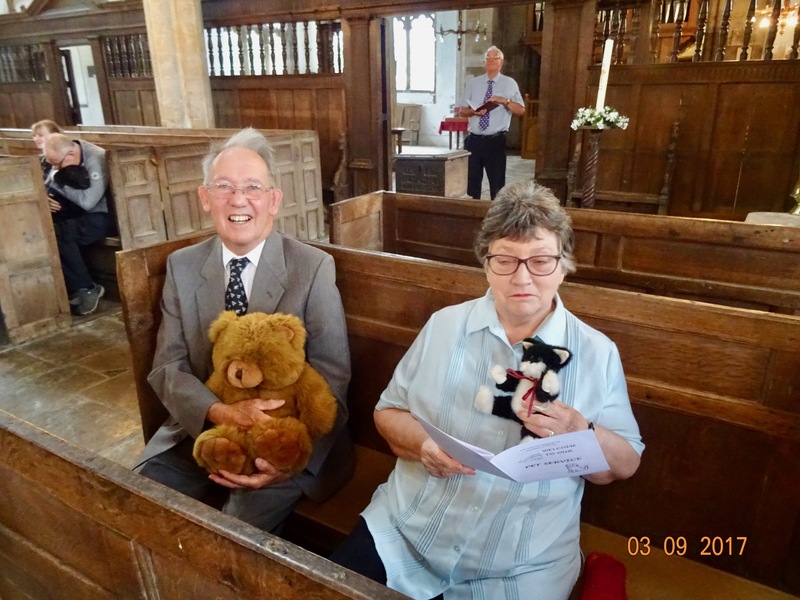 We very much look forward to keeping in touch with you and Elizabeth going forward. 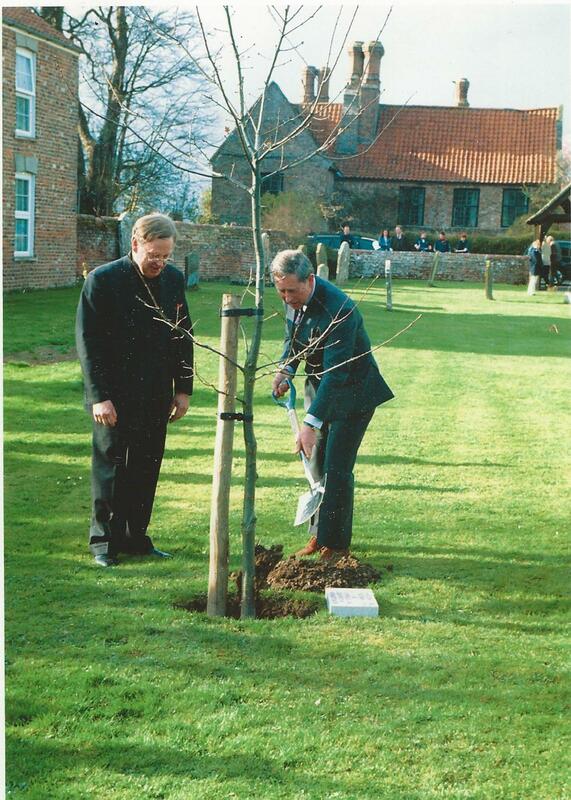 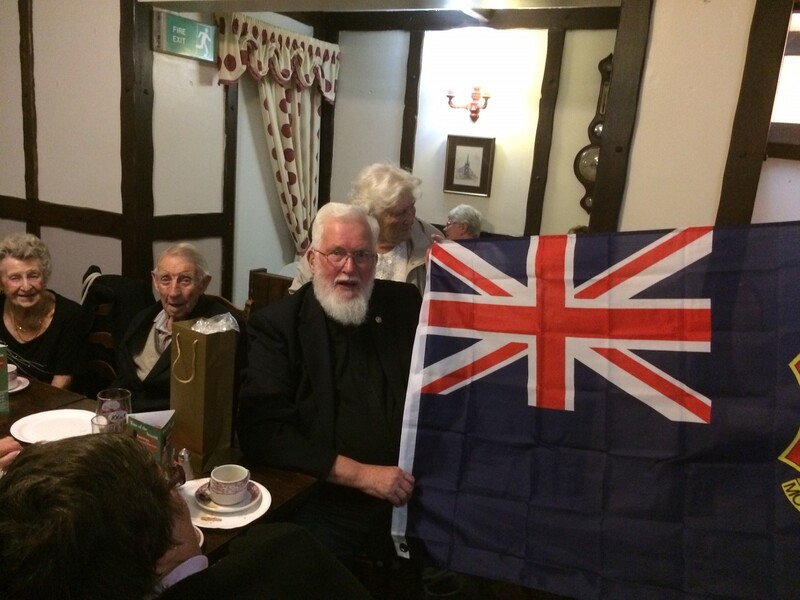 Many thanks also to Mike Wagstaff (one of our other interregnum priests) who remembered that David collected flags. 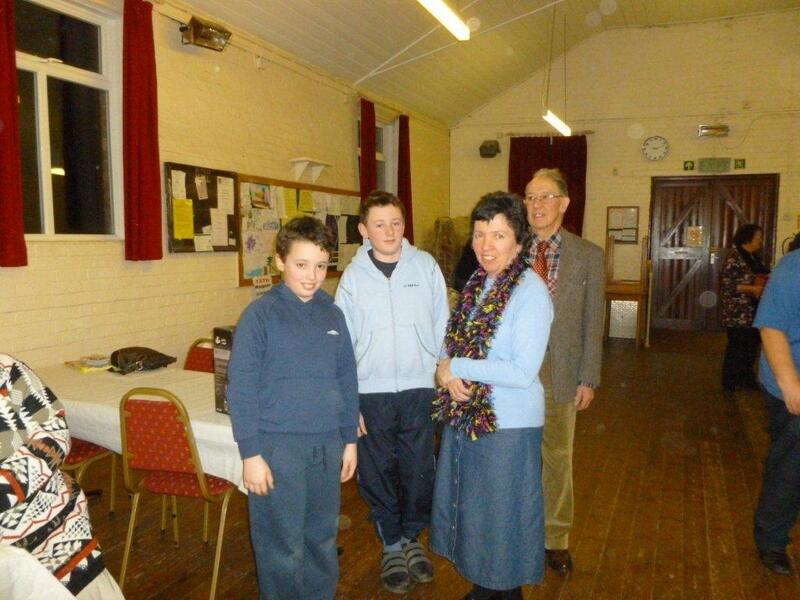 Here are a couple of pictures from the evening. 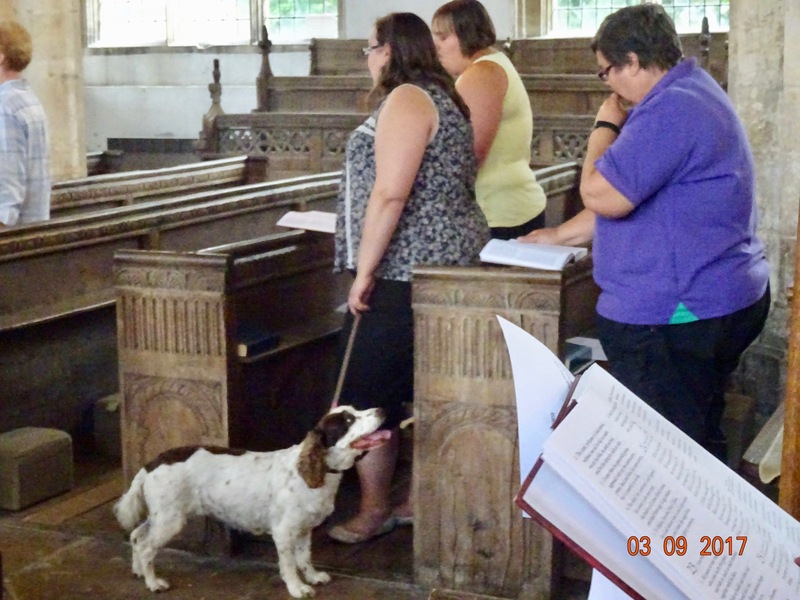 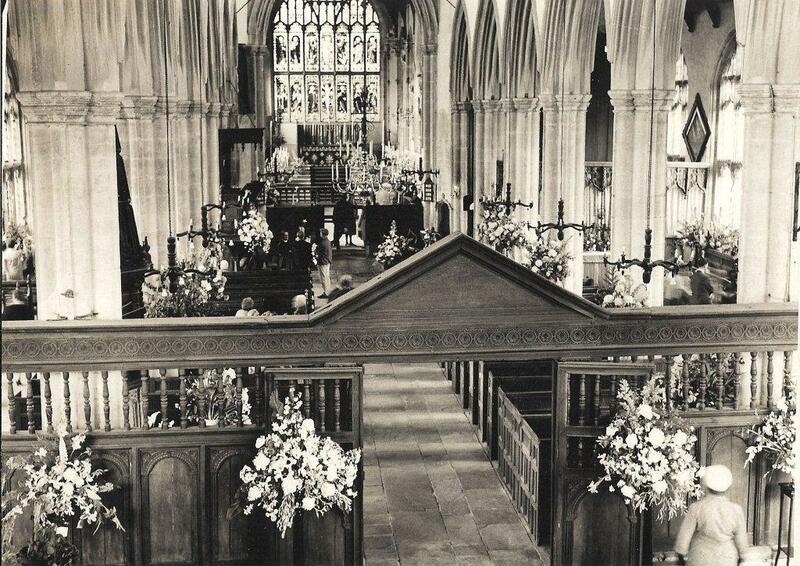 A classical concert was held in the church on Sunday 27th September 2015. 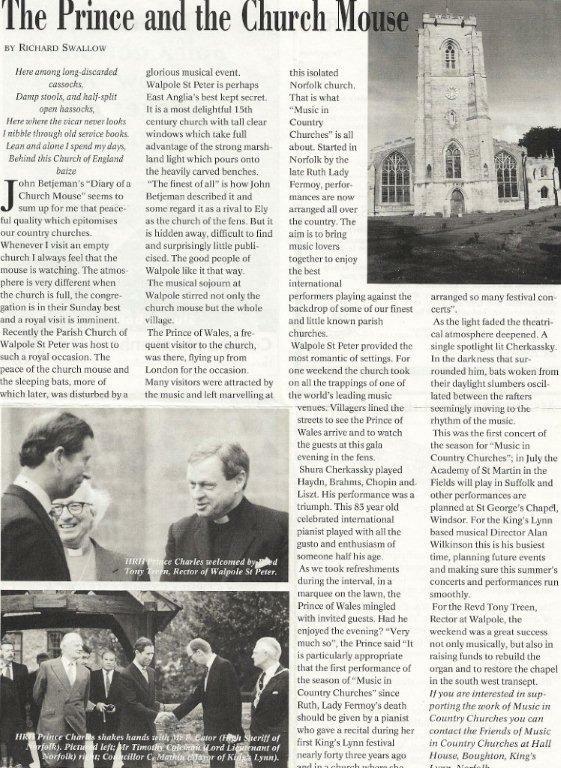 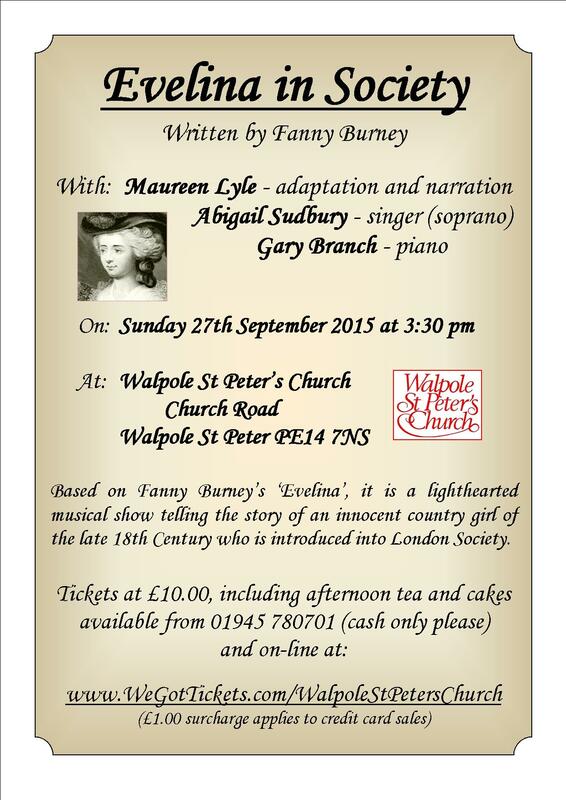 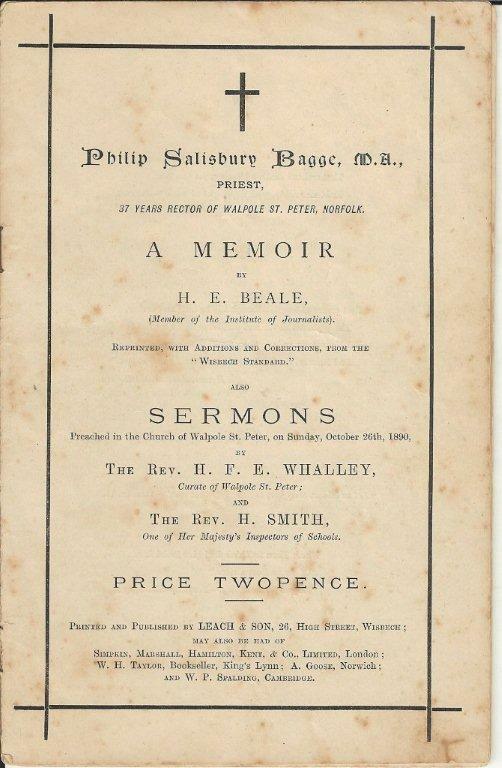 Featuring an old friend of the Church Abigail Sudbury, this event was very much enjoyed by all who attended. 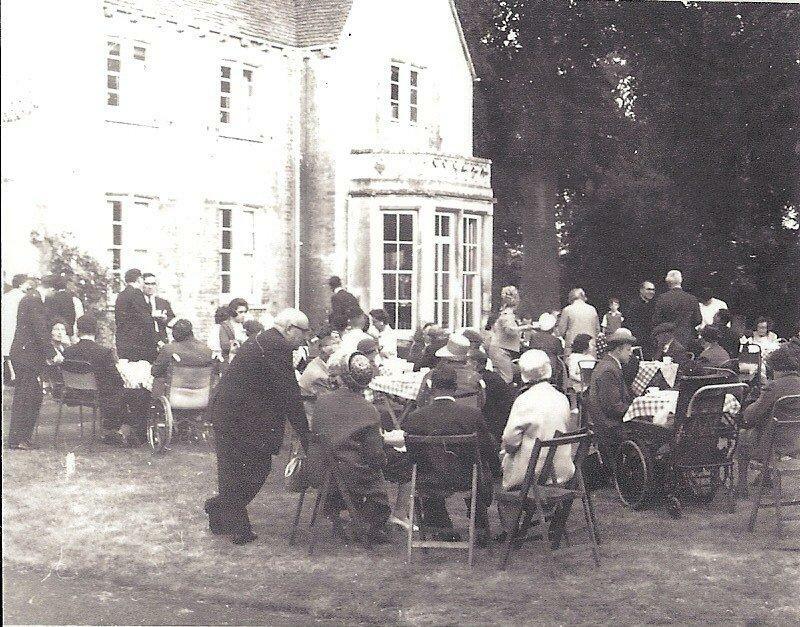 Afternoon tea was served afterwards. 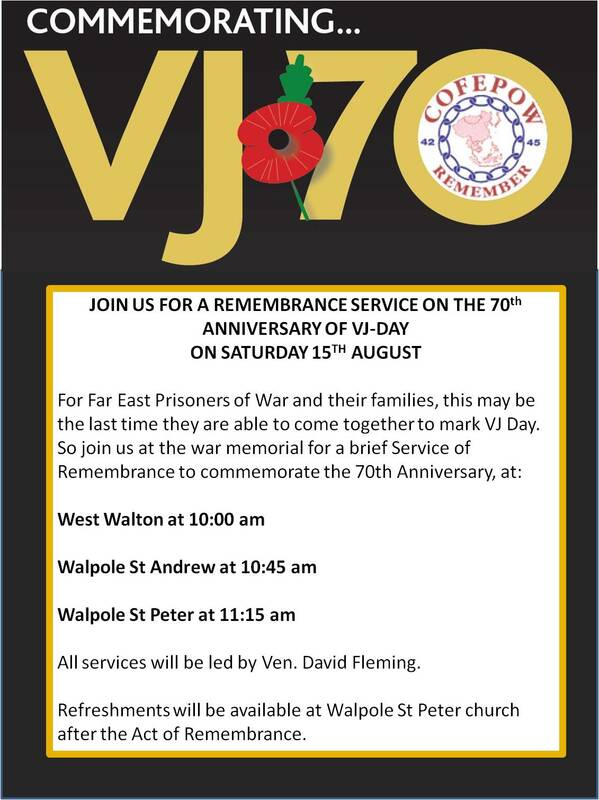 This year - 2015 - marks the 70th anniversary of VJ Day. 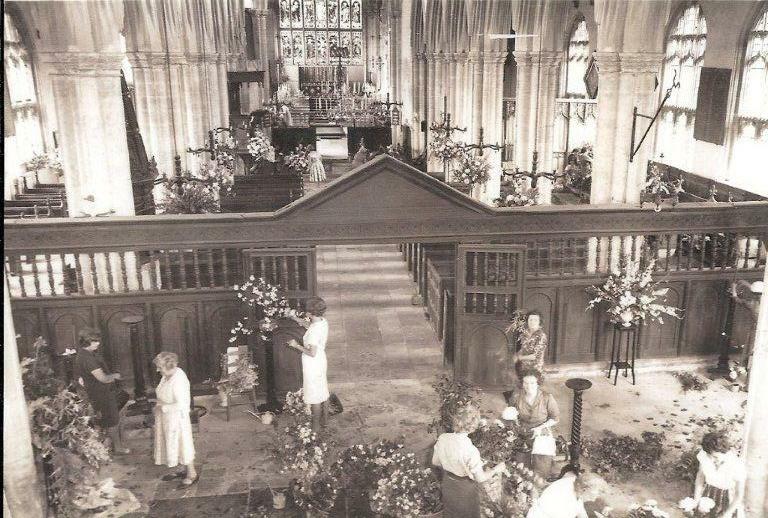 Listed on the War Memorials in our churchyards are the names of a number of villagers who gave their lives in the conflict in the Far East. 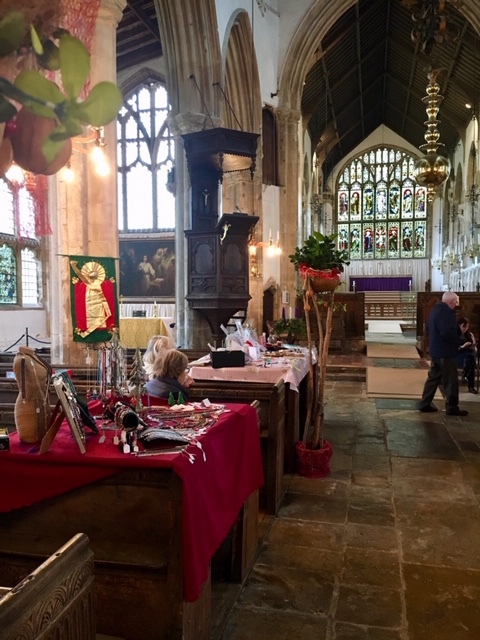 short memorial services were held on Saturday 15th August at each of the war memorials at West Walton (10.00am), Walpole St Andrew (10.45am) and Walpole St Peter (11.15am). 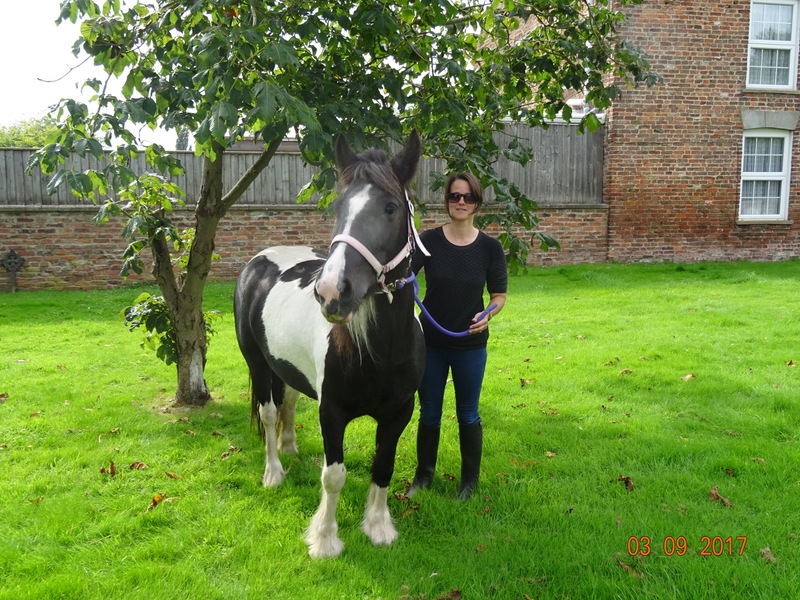 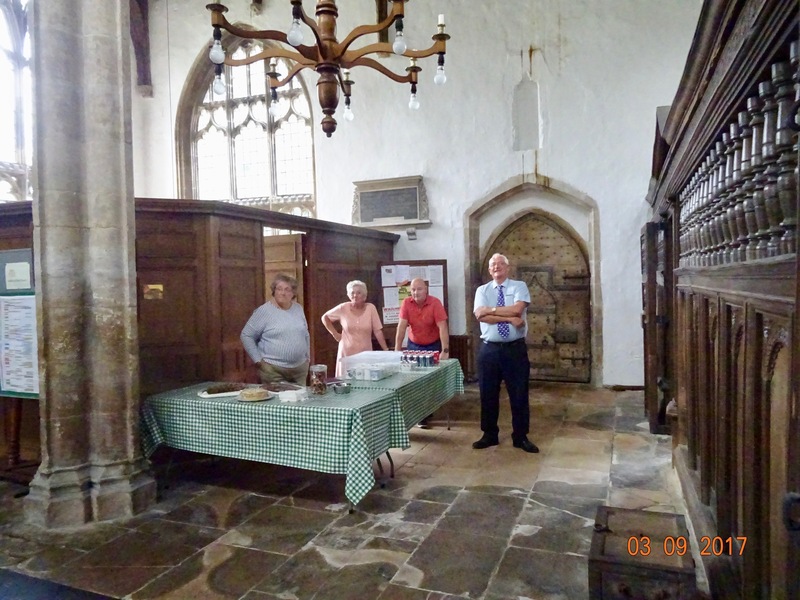 An evening of country and 'middle of the road music was held on Thursday 25th June 2015. 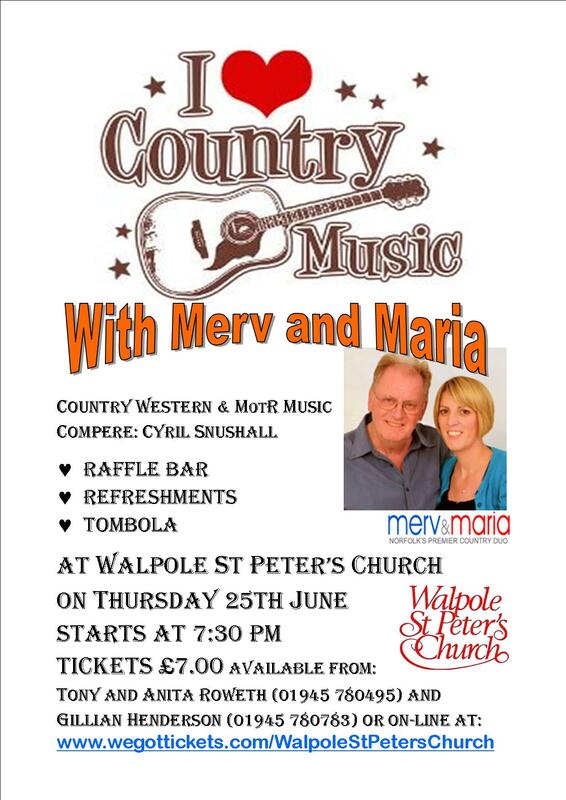 Hosted by Cyril Snushall it featured well known local duo Merv and Maria. 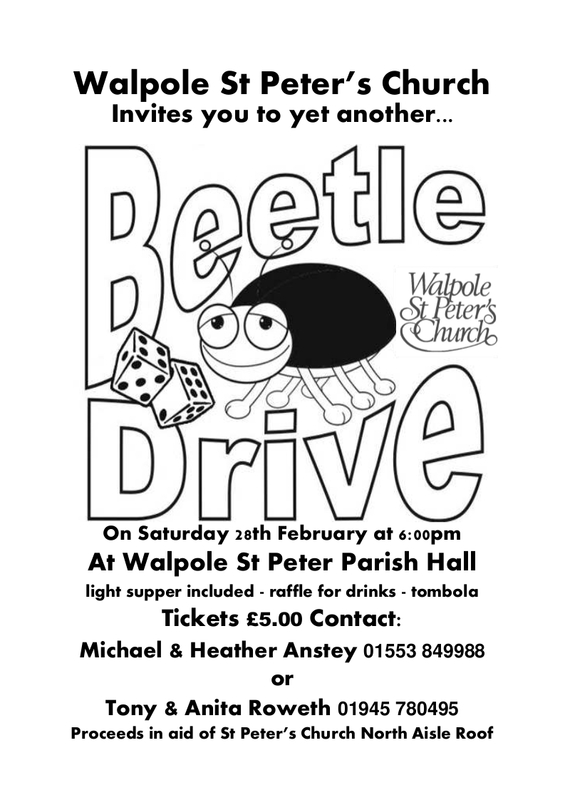 Another Beetle Drive Evening in the Parish Hall on Saturday 28th February 2015. 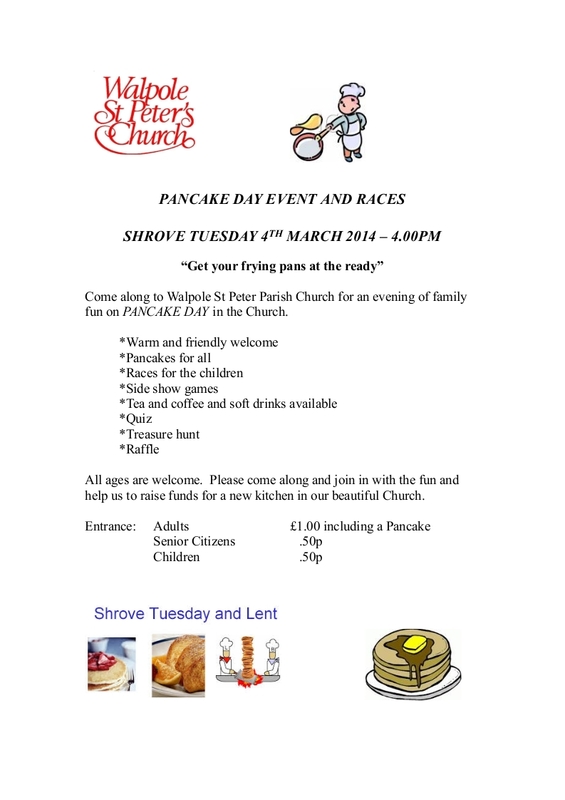 On Tuesday 17th February - Shrove Tuesday we held our Pancake Day Event and Races. 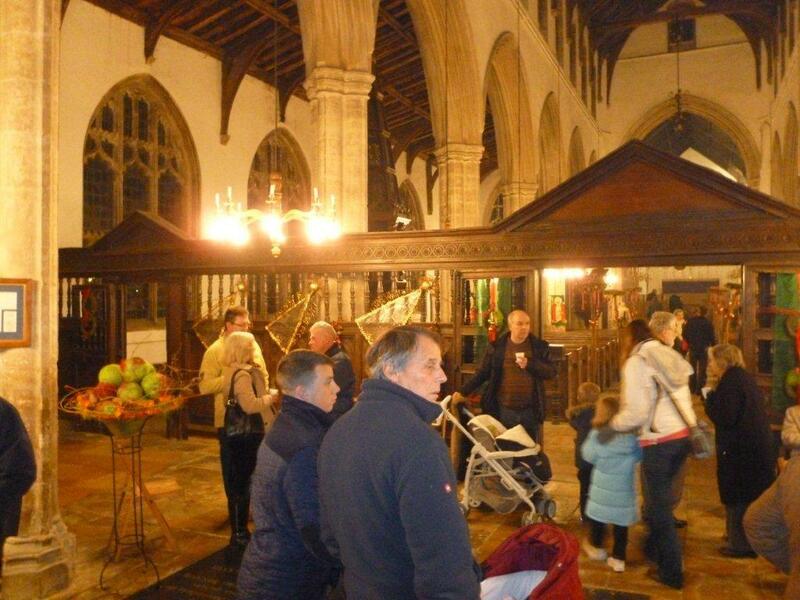 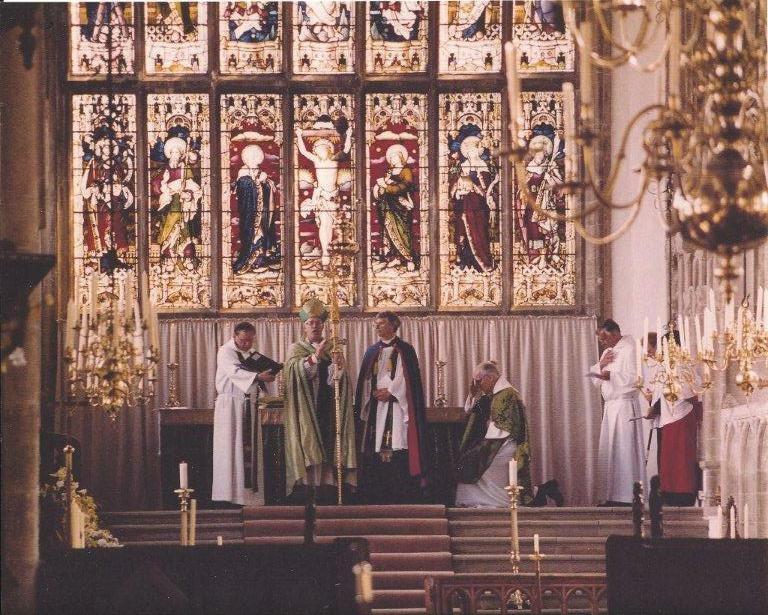 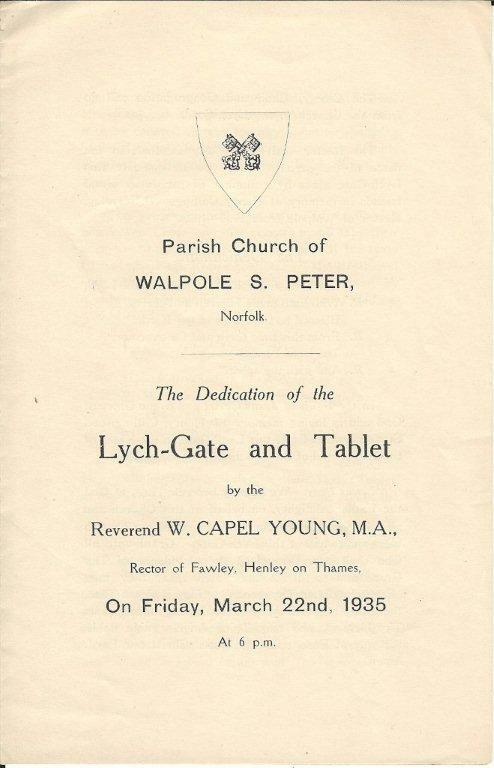 Those who have taken part in previous years will know this is a fun and enjoyable occasion as we all get together to celebrate before the start of the season of Lent. 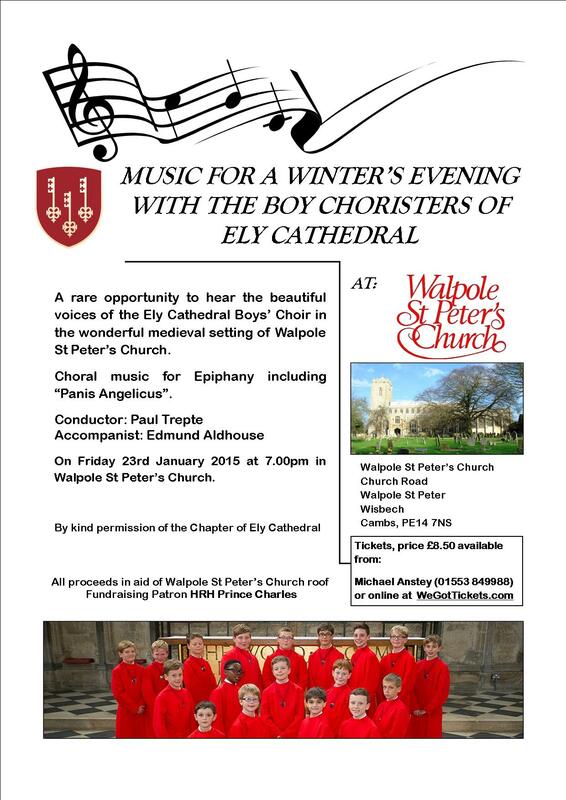 We were delighted to welcome the Boy Choristers from the choir of Ely Cathedral to the church. 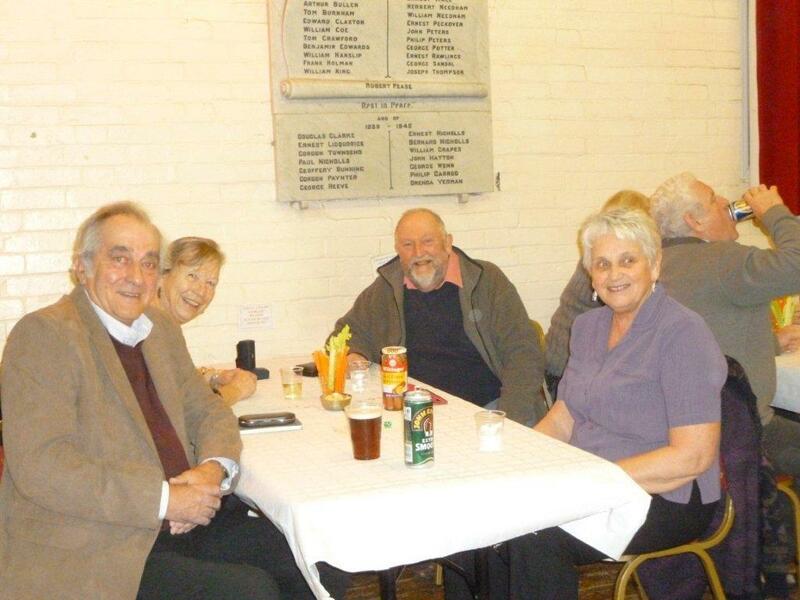 They performed here on the evening of Friday 23rd January. 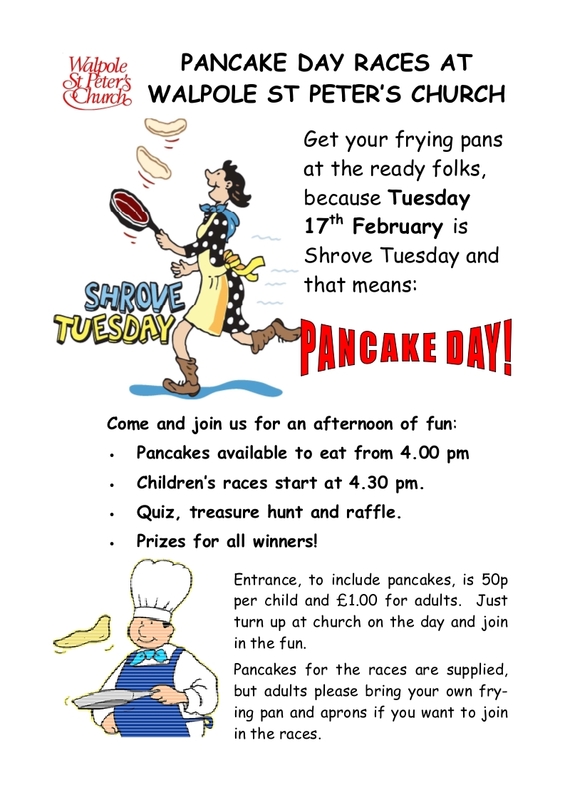 Pancake Day - Our Pancake day event took place and was enjoyed by all who took part. 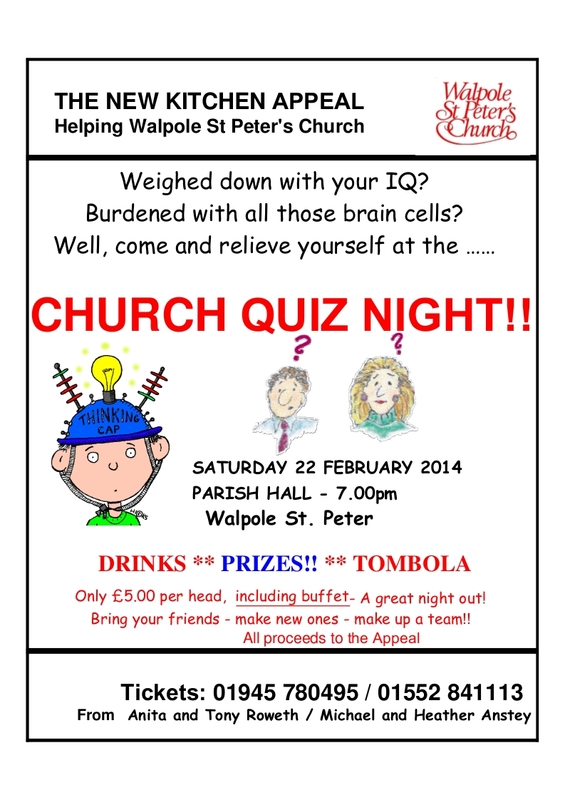 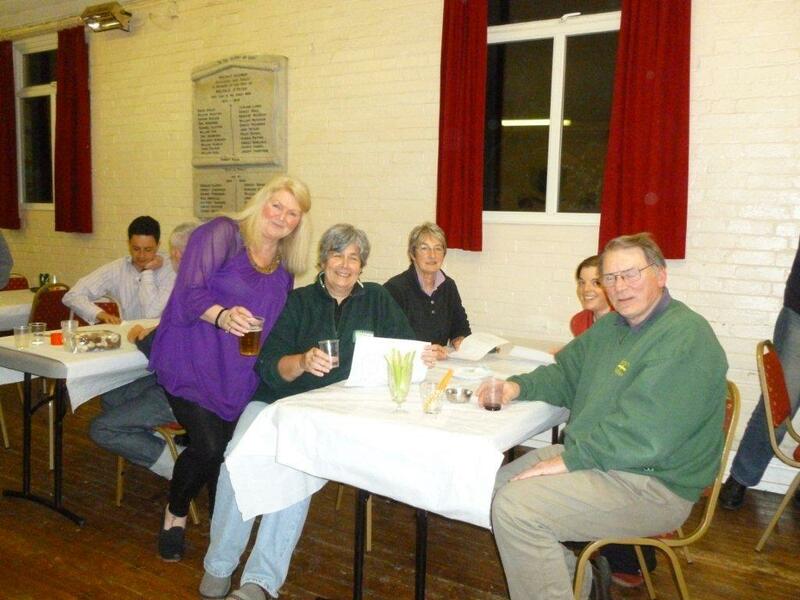 Our Quiz Evening social event in the Village Hall took place on Saturday 22nd February. 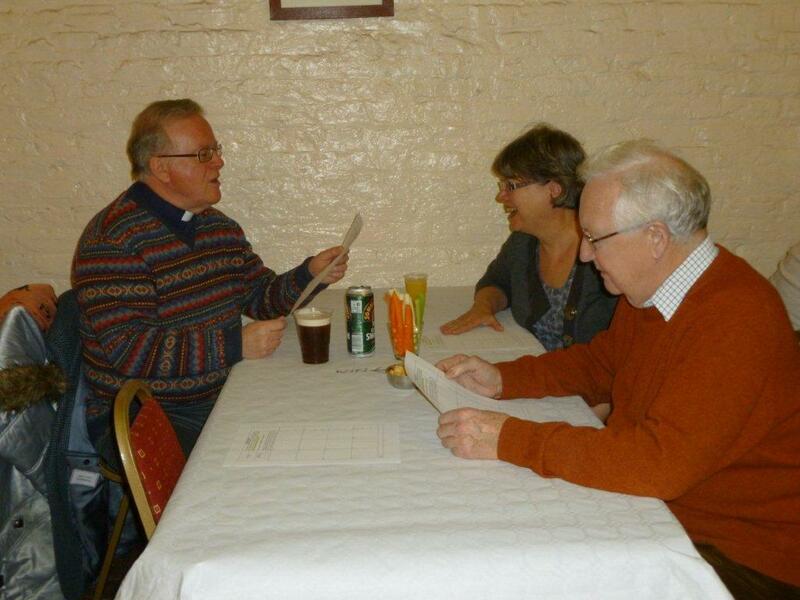 It proved to be a great success with friends old and new coming along to test their knowledge. 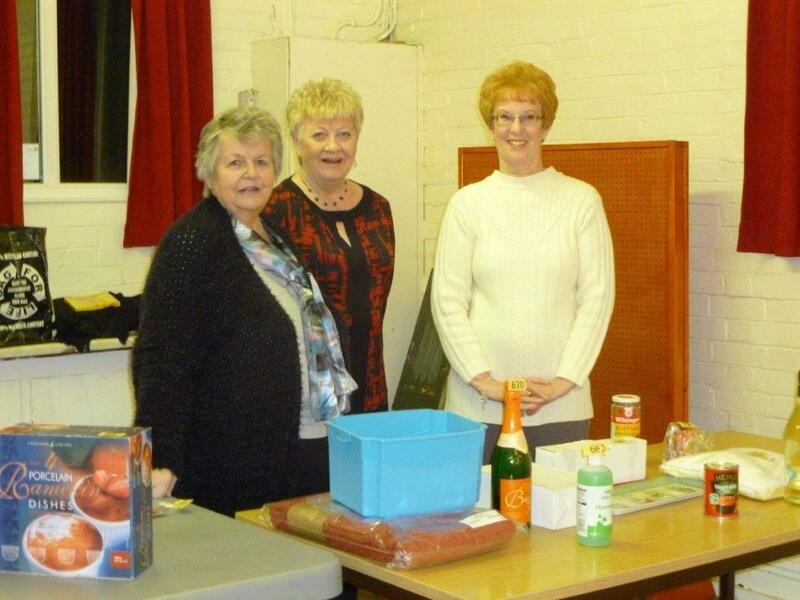 Our thanks to all those who worked hard organising everything and putting it all together. 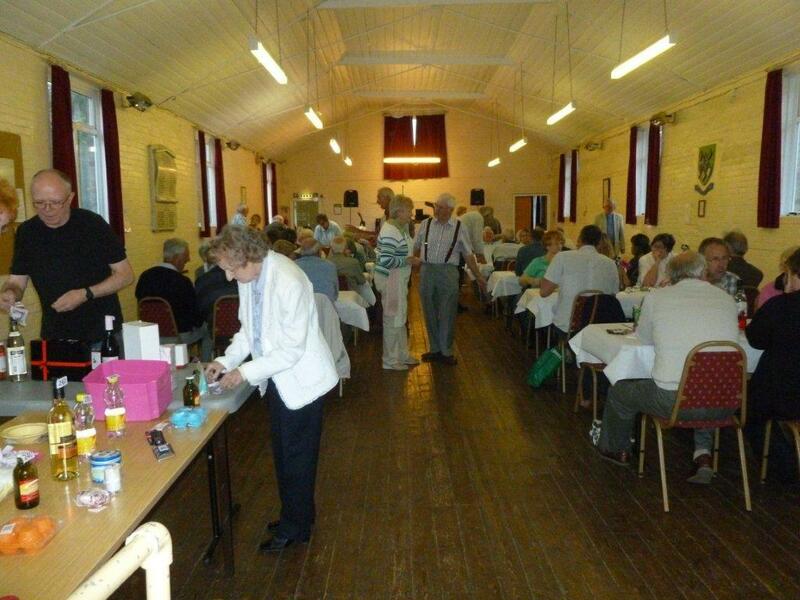 Our Beetle Drive Evening held in the Village Hall on Saturday 18th January 2014 was a huge success. 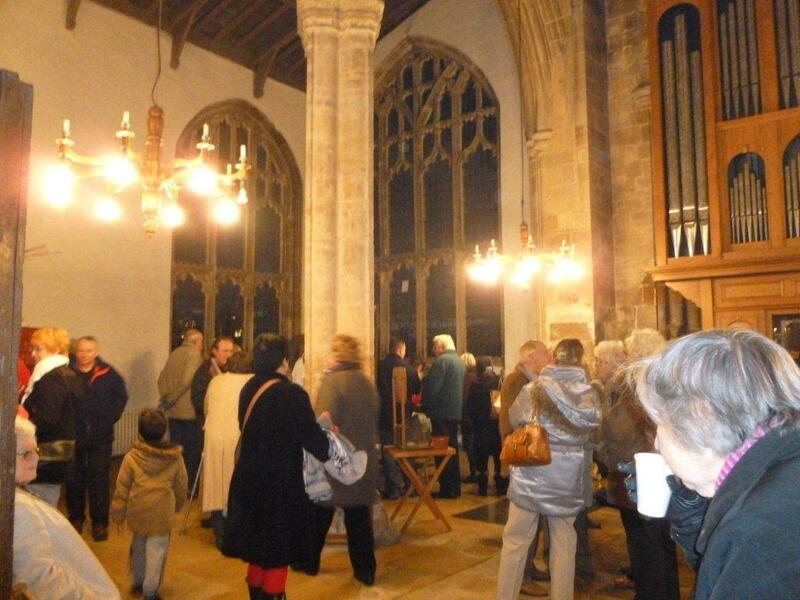 Here are some photographs from the evening. 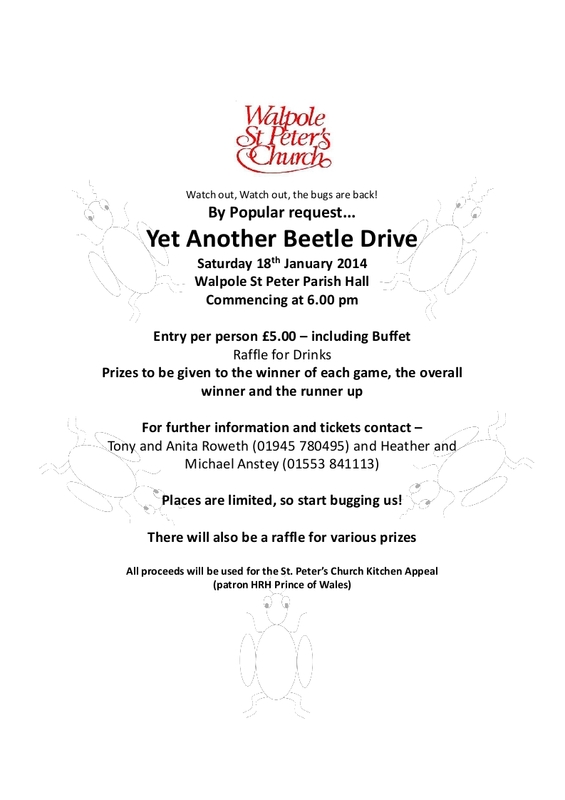 We are planning to hold another Beetle Drive evening again later in the year. 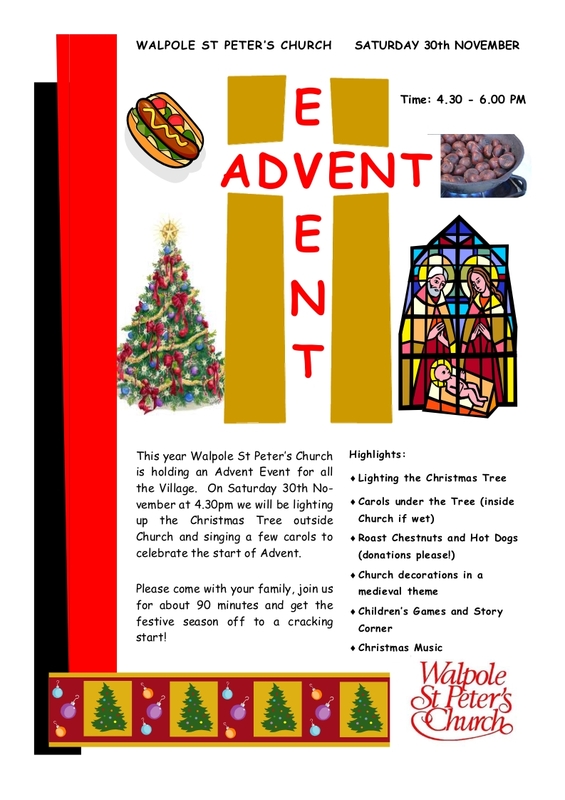 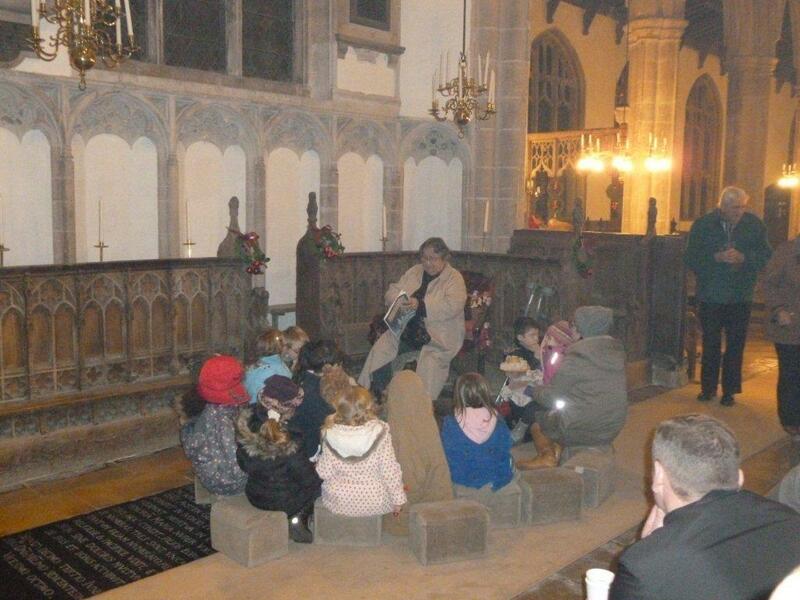 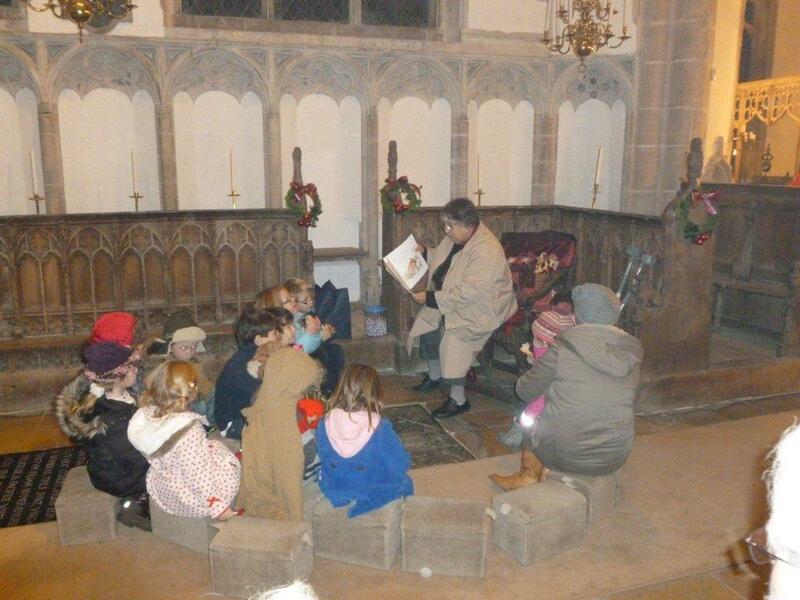 Our Advent Event on Saturday 30th November 2013 was a great success. 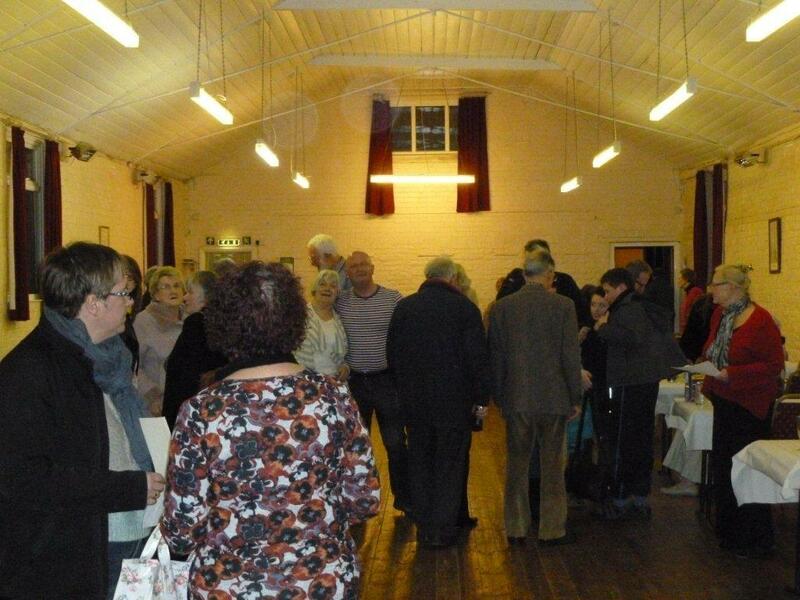 Here are some photographs from the evening. 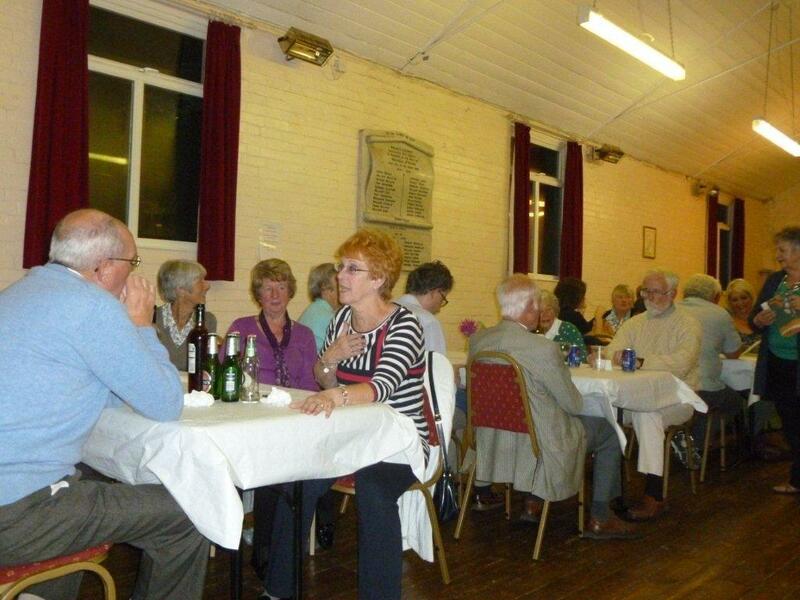 Our Harvest Supper Evening took place in the Village Hall on Saturday 5th October 2013. 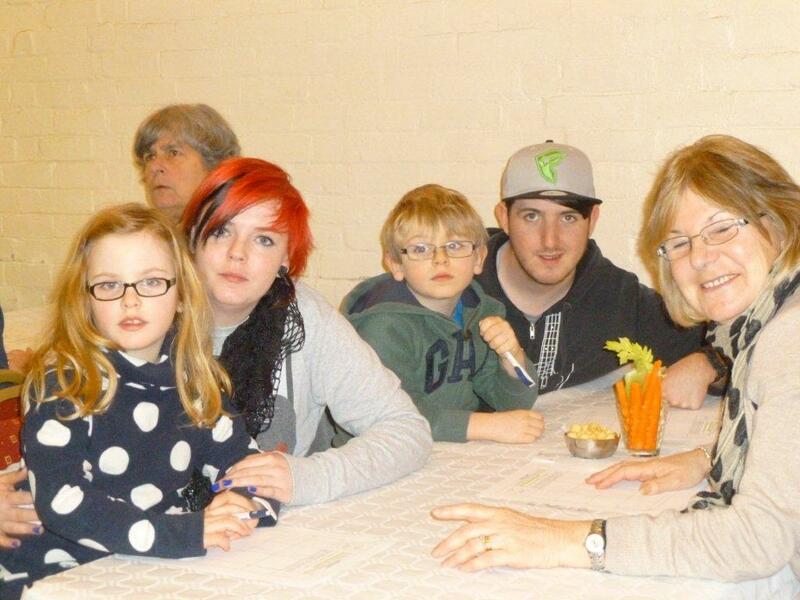 A couple of Pictures from the Evening. 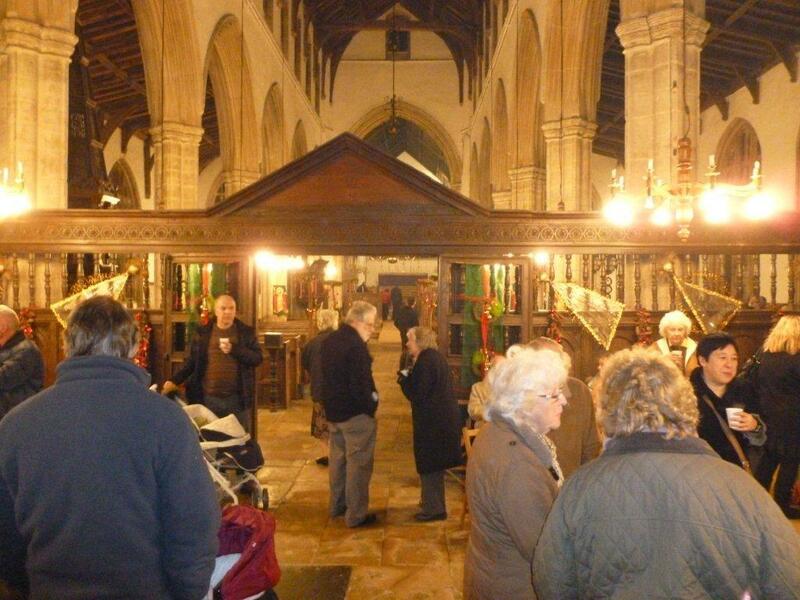 A few pictures from our very successful Beetle Drive Evening, held in early 2013, which raised approximately £400 for our Chancel Roof Appeal. 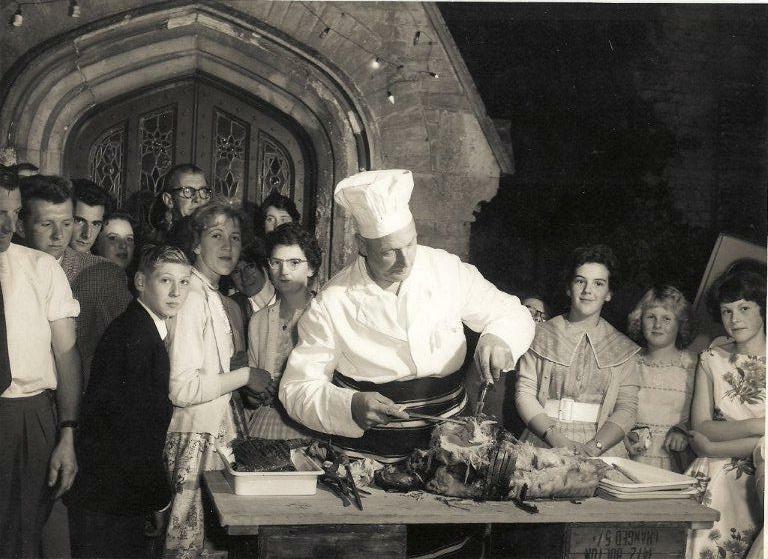 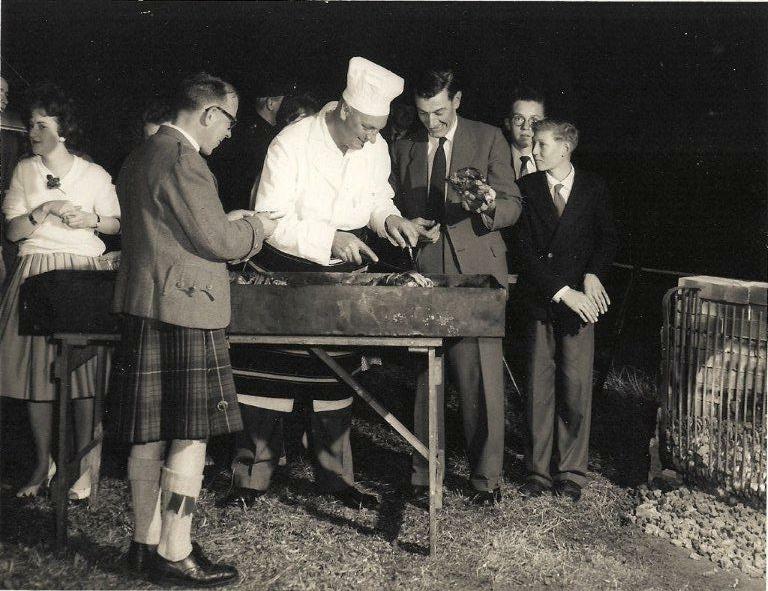 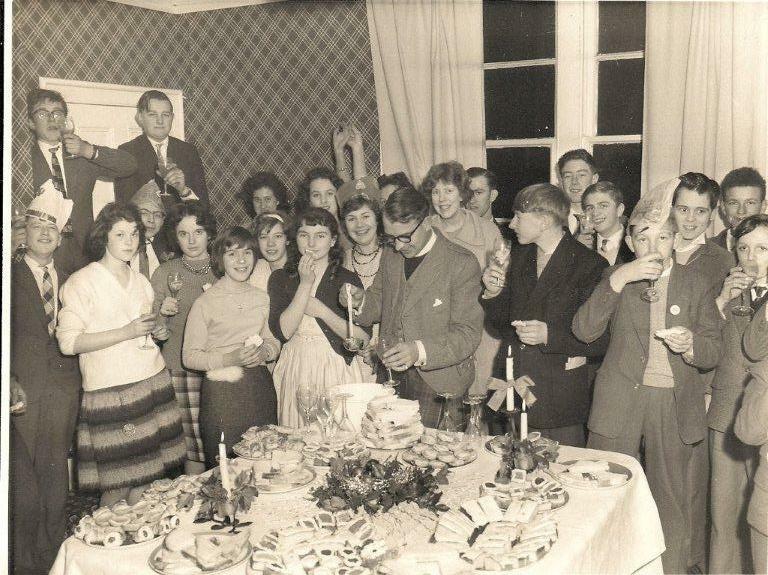 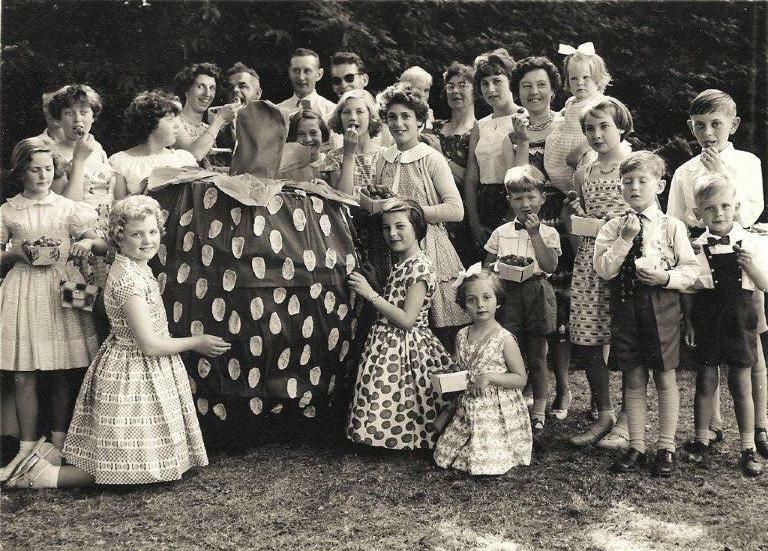 Youth Fellowship Xmas Party 1961 held in the old rectory. 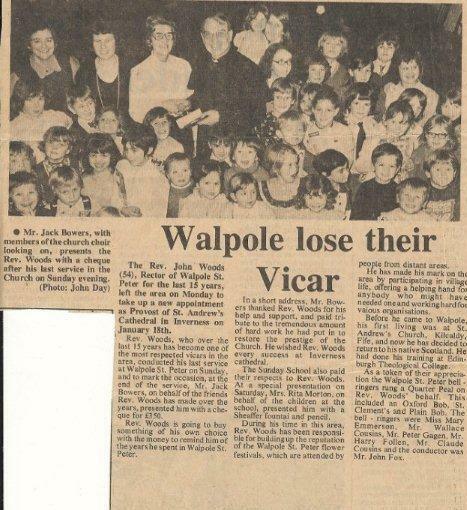 The group photo shows Rev Jack Woods in the centre. 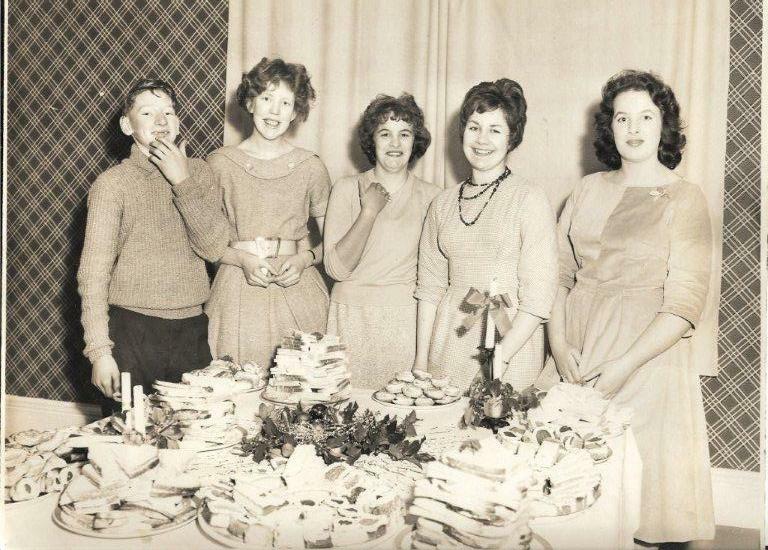 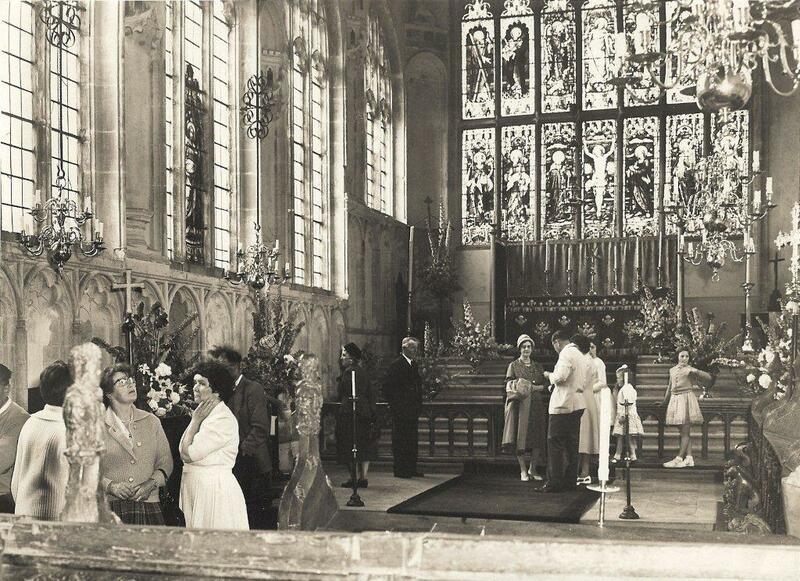 This photo shows from left to right Martin Middlebrook, Jean Knight, Marie Lloyd, Erica Lambert and Audrey Lloyd. 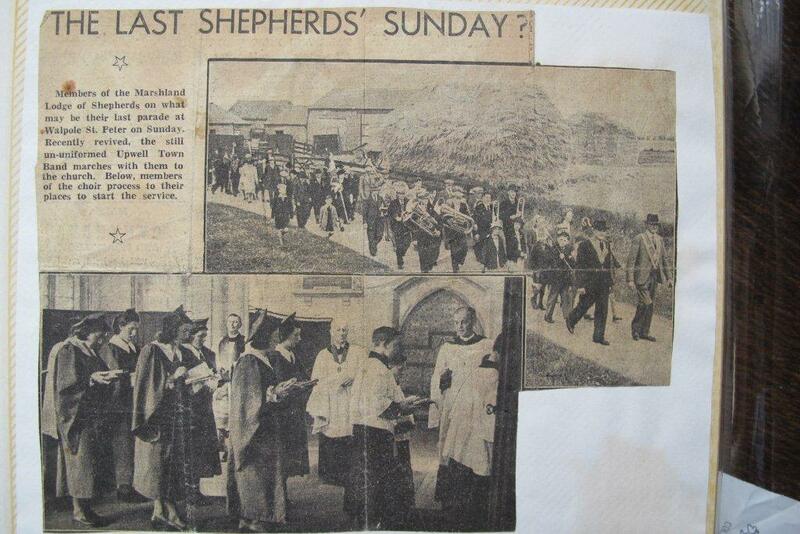 The last Shepherds Sunday parade - The 3 ladies in the foreground. 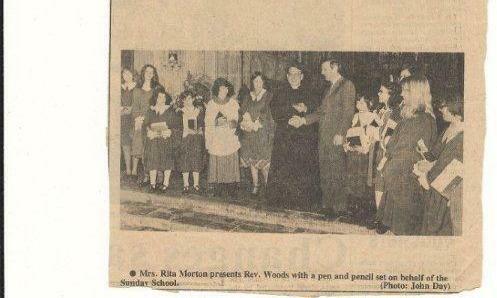 Left to right are Barbara Oughton, Ida Oughton, Olive Oughton. 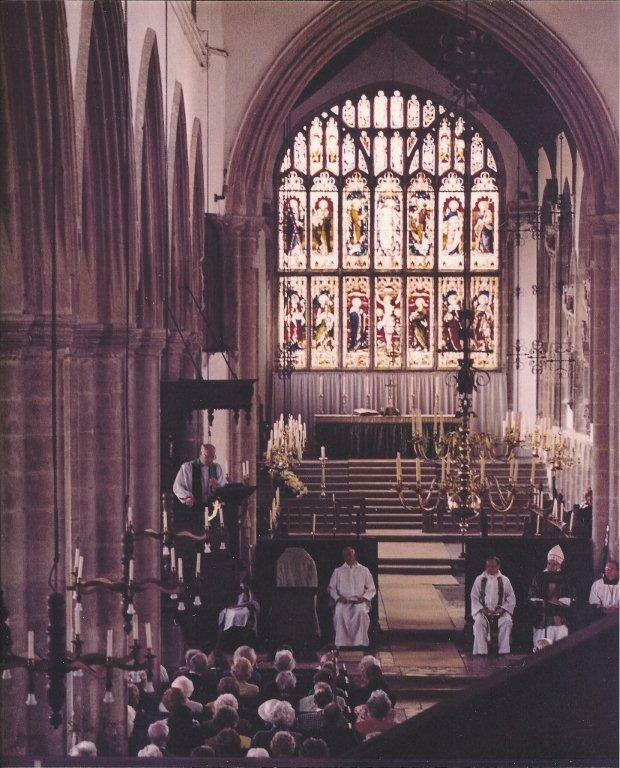 The parade is coming from St Andrews through the Chase towards St Peter's church.